This course provides an introduction to our Financial Coordination policies, protocols, guidelines and programs. The course will take you about 7 hours to complete. You can navigate through the course by clicking on the topics in the table of contents on the left, or by clicking the red arrow buttons on the pages. In some cases, you can enlarge images as well; this is indicated by a magnifying glass icon in the corner of the image. Congratulations! You have been selected by MSF to become a Financial Coordinator (from now on we will call you FinCo). In a few weeks you will go to the field for your first mission. We want you to be well prepared when you go, so we will help you to acquire the knowledge and skills needed to be successful as FinCo in the field. In this course, you will acquire skills necessary to manage responsibilities and tasks related to financial administration and bookkeeping in a field mission. This is an introduction to the course. We have hired you because you have the right competences and experience. We believe you can do the job. Yet if you want to function as a FinCo, you also need to know the MSF specific ways of working: our policies, procedures and tools. They govern much of your work. you were using the application, and you can perform the same actions as in the actual application by following the instructions in the navigation. This course is to prepare you for the FCC face-to-face course in Amsterdam. We feel it is important that you are acquainted with some of our tools, standards and policies before you start the training. In order to get the maximum out of this course, it requires attention and dedication from your side. We recommend you to go through this course step by step. After that there are three chapters that introduce to you our procedures and policies on how to deal with finances within MSF. This theory is about treasury, the management of cash, supply and safety in a mission. The actual tasks you will need to perform when you are in the field are used to explain the theory. Chapters 6, 7 and 8 focus on accounting and familiarize you with our standard bookkeeping software, BooX. You use the software to enter field expenses. The 9th chapter is about managing subaccounts, which is a specific FinCo task. You will learn how to deal with subaccounts and see the difference between personal and MSF expenses. The last chapter is a short wrap up to conclude the course. After that you should be well prepared for the FCC in Amsterdam and your first mission. So in total, there are ten lessons. You will need approximately 7 hours to go through them. It is required that you go through all the chapters before the start of the FCC. It might help your planning if you draft an agenda for the course. Starting in 2014, a new Chart of Accounts will be used in bookkeeping, budgeting and reporting. We have updated this course to reflect the new account codes. During the FCC training in Amsterdam, you will learn more about the new Chart of Accounts. The Finance Procedures will also be revised in 2014 for the new Chart of Accounts and to make other improvements. Throughout this course, you will find links to reference documents. Please be advised that these will be updated throughout the year. 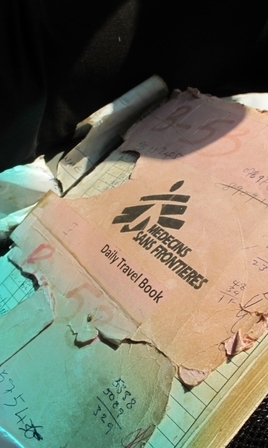 We still recommend that you read these reference documents as they will form the basis of your understanding of MSF policies and procedures. 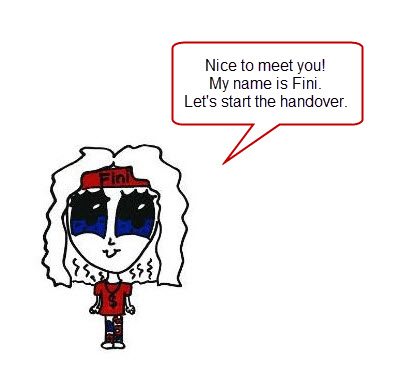 To start we would like to introduce to you your trainer Fini. She will be guiding you through the course and has quite a bit of experience. 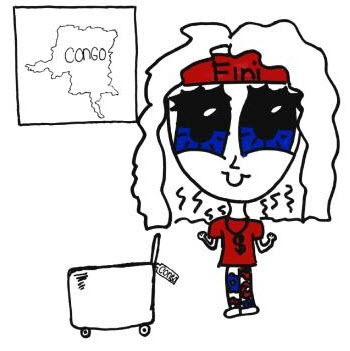 Fini has been a FinCo in Congo, Pakistan, Sudan and Uganda. She might have some helpful tips and tricks for you along the way. You have finished the &apos;Before You Start&apos; chapter. So now you are ready to actually start the course. You know what the course entails, what you are going to learn, and how to handle the software. This chapter will be a short introduction of MSF, the financial structures and your tasks. A general overview of the organization will make you better understand your tasks. 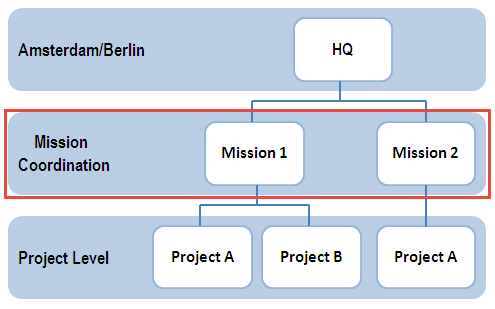 We will use the Uganda e-mission to explain the structures to give you an idea of the set-up of a mission. For this e-mission, you will be working in Kampala, Uganda. 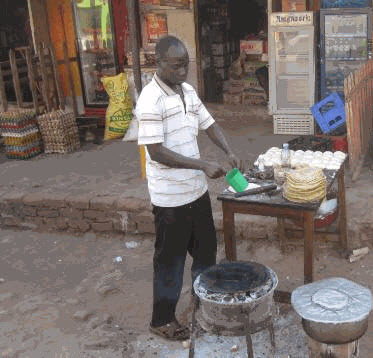 At this moment Fini is the FinCo in Kampala and you will be replacing her. She will tell you more about your role and tasks during this course. Before we go into your actual tasks and responsibilities this introduction will start by explaining the general MSF context. 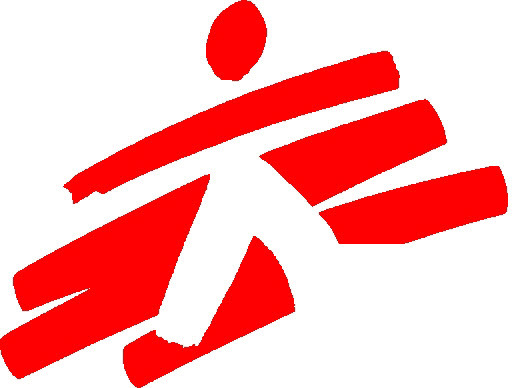 MSF is organized all over the world in pretty much the same way. We have three different hierarchical levels. The first one is headquarters. For MSF-OCA, headquarters are located in Amsterdam and Berlin. Operational Managers and Operational Advisors, who are end-responsible for our missions, work at headquarters. Next to operations, we have support departments (e.g. finance, logistics, the public health department) who develop policies, procedures, tools, and serve as a help desk for field staff. Furthermore, Fundraising and HR departments make sure we have sufficient funds and staffing for our operations. Operational Managers and Operational Advisors, who are the end-responsible for our missions, work at headquarters. Please note that the MedCo, LogCo, FinCo and HRCo (we love our abbreviations) are not line managers, but functional managers for staff in the projects. In other words, they make policies and advise the projects. All hiring-and-firing is done by the line managers. The MedCo, LogCo, FinCo and HRCo are line managers for their staff in mission coordination. The third hierarchical level is the project level. Every mission consists of one or more projects. The project is where the actual field work is done. So if you are working in the Uganda mission, the CMT - Country Management team - (including you) is located in Kampala and the project will be located in Kitgum. Every project has a Project Coordinator (PC). The PC is the highest ranking line manager in a project and is therefore responsible for security management and manages most contact with the local population and authorities. Next there are many medical and logistical staff working in the projects. Only a few will be expats. Most staff in the projects are national staff. Projects vary in size and scope of activities. Large projects can have more than 400 staff, while small project less than 40. 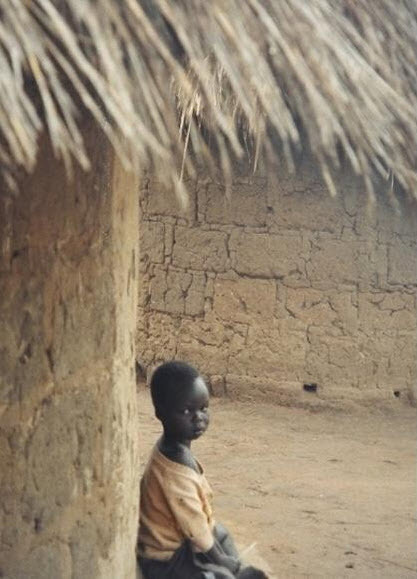 MSF-OCA teams started working in Uganda in 2003, to respond to the emergency situation in Lira District as LRA violence and government resettlement resulted in mass displacement of people into protected camps. Programs were focused on addressing high morbidity and mortality linked to a lack of access to health care, on responding to outbreaks of disease and in helping to reinforce Ministry of Health (MoH) capacity. 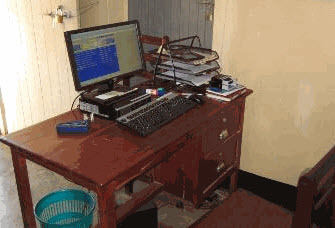 In May 2007, MSF-OCA started supporting the Health Centre IV in Madi Opei, with an Out-Patient Department (OPD), an In-Patient Department (IPD), a maternity and a clinic for HIV-positive patients and patients co-infected with HIV/TB. Following the stability in Kitgum and Lamwo districts since the LRA departure in 2006-2007, significant improvements have been made in health service delivery for both primary and secondary health care. Health system improvements have resulted in improved capacity to deal with main morbidities Malaria, HIV and TB. Considering those improvements and the increased capacity of the MoH, MSF-OCA plans to end all current medical activities in northern Uganda (SGBV, HIV and TB) and close the mission by the end of this year. You will be the last FinCo of this mission. Active lobbying will continue to identify and involve partners/actors to take over components of the medical programs that will not be directly and immediately supported by the MoH. For instance, key factors are the food provision for DR-TB patients and caretakers, as well as the financial support of the VHTs (Village Health Team) network for community services (patients’ default tracing, sensitization, patients’ support during continuation phase of DR-TB treatment, etc.). 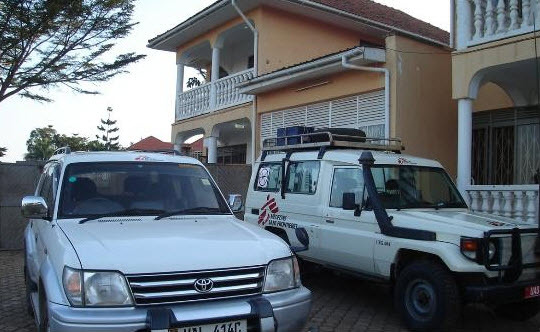 Until the end of the mission and in accordance with intersectional agreement on emergency responsibilities, MSF-OCA will maintain capacity to effectively respond to emergencies as per EPREP plan. Currently the team in Kitgum is comprised with 5 expats: PC, All round Log, MTL, MD and Nurse; and approx 56 national staff. The Coordination team in Kampala is comprised of 4 expats: HoM, MedCo, LogCo, and FinCo; and 21 national staff. You will be working in the Capital but will also make trips to the project. 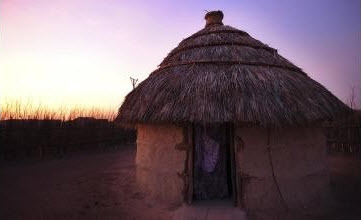 Below is a film on how a compound in a project in South Sudan looks. It is not Uganda but it is quite similar. 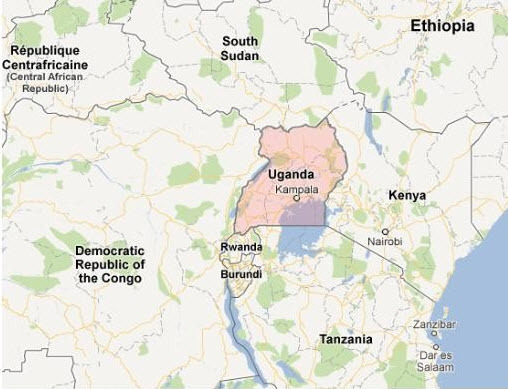 As you can see on the map, South Sudan borders Uganda. The film might take awhile to load. So what does it mean to manage the Uganda Mission financial side? As you can see below with a budget of 1.5 million and 150 national staff members, Kitgum is considered a medium sized project. Still, managing nearly 2 million Euro is not a small task! On what do we spend our money? ...and where does it come from? In order to finance our operations we depend on certain revenues. Most of the money we receive is from private donors. Private donors are people like you and me who support the work that we do. The money we receive from (governmental) institutions is called public funding. We make a difference between private donors and institutional donors. During the FCC you will hear more extensively about this and our revenues. 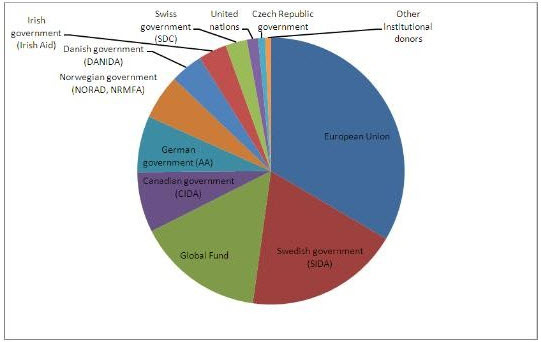 Below you see an overview of the grants we received from institutional donors in 2011. As a Financial Coordinator you fall directly under the Head of Mission. Together with the Head of Mission, the MedCo, the LogCo and PCs, you will be part of the Country Management Team. So you are a manager! You will be the functional manager for the Logistics Administrators in the field. The Log Admin deals with the financial and HR issues in a project and will ask you for support when needed. You are also the functional and hierarchical manager for the administrative national staff working in the capital. So you delegate tasks and support and control the ones executing those tasks. You are responsible for the long term planning and analysis of the mission finances. The daily activities are delegated to others. You are responsible that they are aware of the protocols and do their jobs correctly. Financial management is not just about keeping accounting records. Financial management entails planning, organizing, controlling and monitoring the financial resources of the organization to achieve the objectives. A good practice in financial management will help the mission be effective and efficient using the resources to achieve the objectives and to help the mission be accountable. In order to do your job and achieve good financial management in the mission, there will always be help from HQ in the form of tools, policies, procedures, support, training and coaching. Also keep in mind that you form a team with your colleagues. They will also be willing to help you out if you need support or advice. Do you still remember the following abbreviations? Can you match them? You have completed the Introduction. 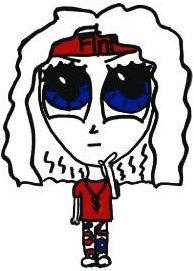 Are you ready to become a FinCo?! In the previous chapters you have learned about MSF and how the financial structures within MSF are organized. This chapter will focus on treasury and how these structures influence your daily activities handling the finances of a mission. The projects handle a lot of money to finance their day-to-day business. As a consequence there is also a lot of money at Capital level. The FinCo is responsible for the main safe in a mission. For the day-to-day business your assistant will manage the petty cash box. In this chapter we will look at the different daily activities you will encounter. A lot of policies and procedures are put in place within OCA when handling money. During this course we will go through most of them, but let me first explain to you why these procedures and rules are important. There are often no banks where we work. 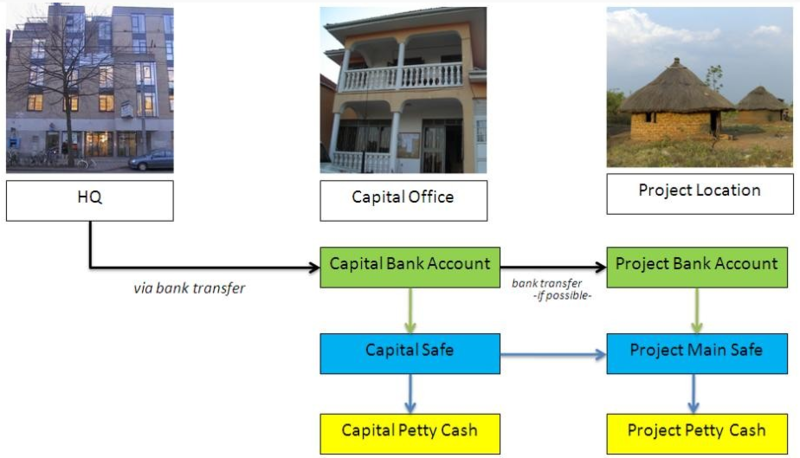 Although for the mission at capital level there is a bank account, most projects have no access to banks or bank accounts. Therefore in some cases the money for the projects will be hand carried in cash to the projects. Payments to suppliers are also usually done in cash. This makes you vulnerable to theft, fraud and robberies. Proper bookkeeping is a way of limiting these risks. Clear procedures, tools, regular checks and verifying balances are vital in a mission to protect you and your staff. You as a FinCo will be handling the finances of a mission. That role makes you the key person to perform checks and follow up on the right procedures. These procedures and policies are mentioned and used as a reference throughout the chapters. At project level the Log Admin is responsible for proper bookkeeping in the project. 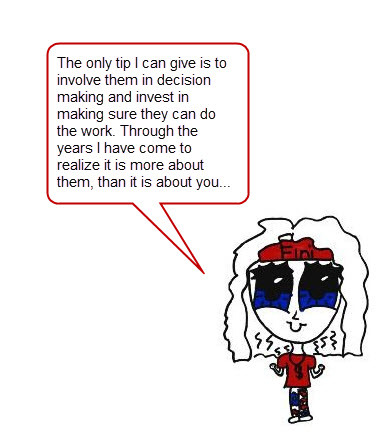 On mission level you will most likely have an assistant or a cashier in place to help you with the daily activities. You as a FinCo bear however the final responsibility and need to make sure all entries are done correctly. Therefore we think it is important to inform you about the correct procedures so you are able to manage the people on mission and project level. In this module we will look at the procedures that are in place in MSF missions to safely handle the finances of a mission. These procedures will be introduced to you by using several case studies. The case studies are intended to give you an overview of your responsibilities and the theory of dealing with the financial means of a mission. With the case studies you can find links in the text. These links refer to the actual policies or forms, so you can see what they look like. Later on in this course we will practice the tools you will be using in a mission. There are different types of payments in MSF. You will be dealing with cash payments, cheque payments and bank payments. As was mentioned on the previous page, you are not the only one dealing with payments, but you are the person who will keep an overview and will control payments and expenses. A lot of payments are still done in cash, especially on project level. Therefore the next chapter will be fully on cash management. Since cash payments are a big part of the financial daily business it will be addressed throughout the whole course. There is also a practical module on how to enter cash entries in BooX. Cash payments are payments in cash to a supplier or an advance to a staff member. You are responsible of managing the main safe at the mission and your assistant or a cash keeper will be in charge of handling smaller amounts of money for the day-to-day business using the petty cash box. Quite often suppliers for bigger purchases are paid with a cheque. You will write out a cheque for the amount of money that you owe. The supplier will cash this cheque at the bank. The amount only then will be written off the mission&apos;s bank account. The chapter BooX: Bank Entries will go more in depth on cheque payments. If there is a good banking system in place you are able to transfer money to the projects by bank. You will understand that this is the preferred option, although it is not always available. The money that you will receive from HQ in Amsterdam will always be through a bank transfer. There is a special module on bank payments and how to make entries for bank payments in BooX. The first one of the day-to-day activities that Fini will explain to you during the handover is giving out a work advance. This work advance is used for a local purchase, to pay a third party for goods or services. A cash keeper will handle the advance request and give it from the petty cash box. A purchaser for example will ask for an advance. When he needs to buy something locally he will ask for money to buy the goods. After the purchase the advance will be settled using the receipts he got while buying the goods. 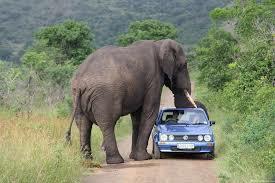 So the local purchaser in the Uganda mission is asking you for an advance, since your assistant has a day off. Fini will help you by explaining the things you should keep in mind. We will go through the different steps the persons involved should take and what they should consider when asking for and handing out an advance. There is also a procedure available on Work Advances and Redemptions. The advance requester will complete an advance form or provide a completed Local Purchase List (PL) if for logistical items. These forms must be signed by an authorized person. In every mission there is a list with authorized persons available that indicates who can sign for what. Here is a link to an example of a request form. The cash keeper will check if the form is signed and add the advance that is given in the Advance and Redemption Book. The cash keeper will also ask the purchaser to sign for the money he receives. The purchaser will go to the market and buy what he needs like plastic buckets, food for lunch or a hammer and nails for the construction site. He pays using the advance. 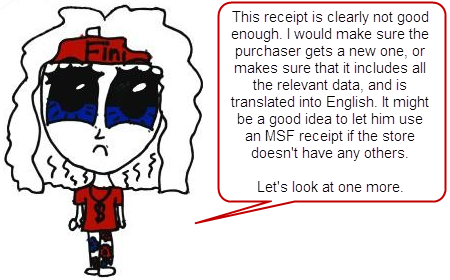 He needs to keep the receipt of the purchase or ask the supplier to use a standard MSF receipt. Within a week the purchaser will settle the advance with the cash keeper. Therefore the purchaser will first have the receipts signed and checked by the person who authorized the advance. 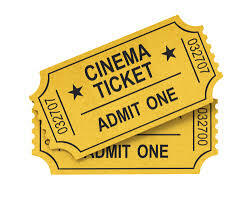 The cash keeper will receive the signed receipts and money to redeem the advance. The advance form will be signed to indicate that the advance is settled. Also the Advance and Redemption Book is updated and signed by the purchaser as well as the cash keeper. The cash keeper will process the receipts according to the regular day-to-day bookkeeping procedure. The cash keeper is the person who is responsible for the petty cash box or safe. In the field it will be the Log Admin and at capital level it will be the FinCo or a national staff administrator, like your assistant. The actual job is executed by someone else, but you will (re-)write and implement the instruction. It is the responsibility of the FinCo that the bookkeeping tasks are understood and correctly done by all administrative staff. 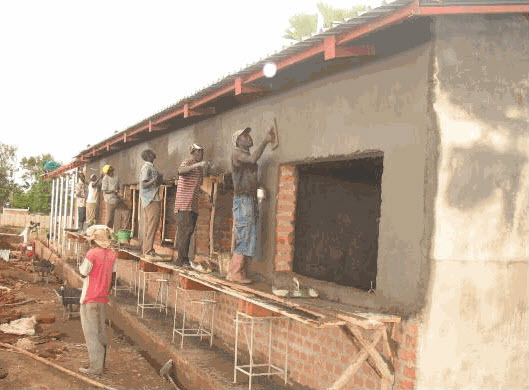 While you are working in the Uganda mission there is construction going on of a TB ward, where we will treat TB patients. It is starting to look really nice. At one point you receive an invoice for the labor of the construction work that is done. How would you handle this invoice? The first step is of course to check the invoice; was the work really done, for the agreed price? Checking bills and invoices is an important part of your job. Therefore we will have a whole chapter on checking receipts and invoices later in this course. Assuming the job was done and the invoice is correct, we will focus on the actual payment. Payments by cheque are preferred over cash payments for the reasons mentioned earlier. There are two different policies: one on cash payments and another one on bank/cheque payments. But the basic steps for you as a FinCo are not that different, as you can see in the diagram below. To conclude, for all payments it is good to keep in mind that there should be a functional difference between the person who orders the goods, the person who receives the goods and the person who pays for the goods. In this short chapter we have briefly explained to you what the daily financial activities are. This was merely an introduction to the procedures. The basic steps for petty cash management are roughly the same, when you either handle an advance, pay a supplier or reimburse an expat for his travel costs. In the following chapters we will focus more on the actual activities, e.g. how to handle money safely, how to check an invoice, and how to make an entry in BooX. Also for this chapter we have prepared some questions. Write down in your own words what you think is right. On the next page you can find my answers, but first try to do it yourself. What are the different payments you can encounter in your mission? What are the similarities between these payments? And what are the main differences? If other people like the FinCo assistant are doing the actual job of paying suppliers and handing out advances, what is your role then? The different payments in a mission are cash payments and payments done through the bank or via a cheque. Your role is to manage and support the bookkeeping staff in the mission. This entails training and implementation of the procedures and policies. You maintain strategy on the financial and HR structure in the mission, including writing and implementing policies. Now you are aware of the daily activities in the field. You know about the different sorts of payments you can encounter and you can manage the petty cash of a mission. 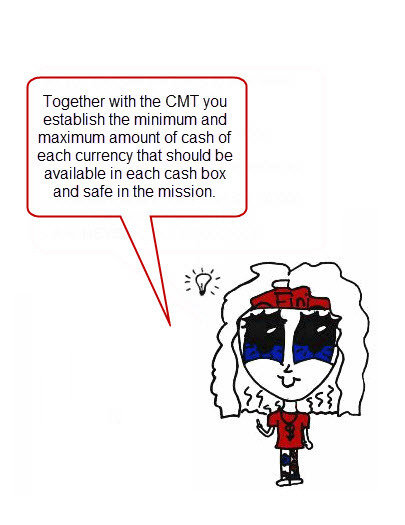 In the next chapter we will focus on safely handling money in a mission and cash management in the mission. In the previous chapter it was explained that there is a lot of cash flowing in and out of our projects. Therefore we think it is important to have a module on cash management. It is your core business to control and advise on the financial structures in the mission. Here you see the money flows from HQ to the field. The next page shows you the possible money transfers that you can encounter in the field and which we deal with during this chapter. The amount of cash that is used in a mission is a safety risk as was explained in the previous chapter. 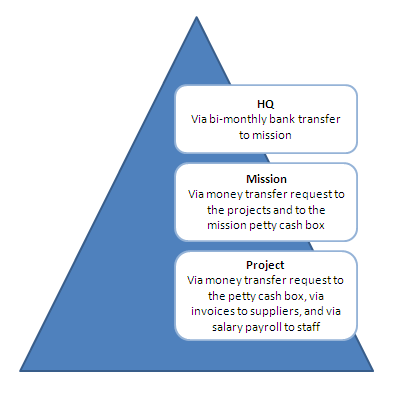 The cash in the mission and projects needs to be managed. We really want to emphasize the importance of the rules and procedures in place when dealing with money and money transfers. We will start by explaining cash flows from HQ to the mission and what kind of money transfers there are. 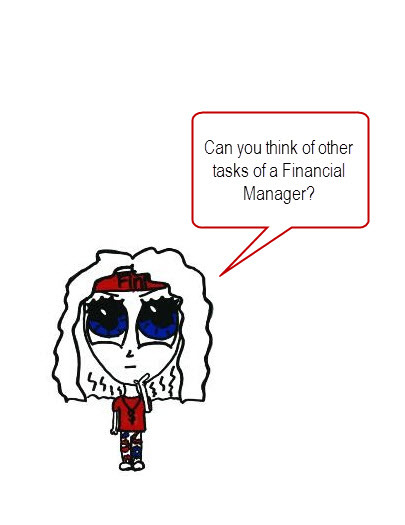 Later on in this chapter you will be dealing with actual tasks related to cash management. There are different ways to store money: in a bank account, a (main) safe and a cash box. You are responsible for all of them. When you come to the field you will make an overview of all the cash boxes and safes in the mission, including their location and who is responsible for them. More information on this is described in the general policy on Cash and Safe Management. 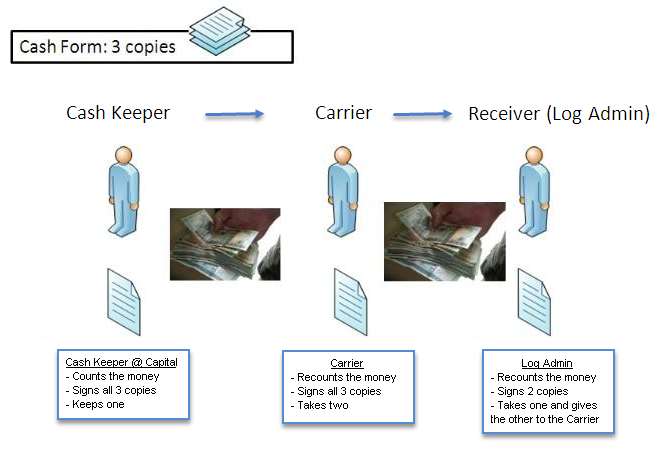 As you can see from the previous two pages, there are different ways to transfer money. We will now deal with money transfers and the corresponding policies. The cash flow from HQ to the mission will happen bi-monthly through a bank transfer. It is a fixed amount that can be modified at each reporting and decision making moment of the Control Cycle: Autumn Control & Planning (ACP), Spring Control & Planning (SCP). If needed an extra money transfer from Amsterdam to Capital can be requested. These transfers are facilitated by an external company. Their service includes online access and a confirmation by email when you have received the money. They also provide the exchange rate information on the deposit ticket. In Kitgum they do not automatically receive a fixed amount in their bank account. Projects need to forward you their money request by the end of the month. 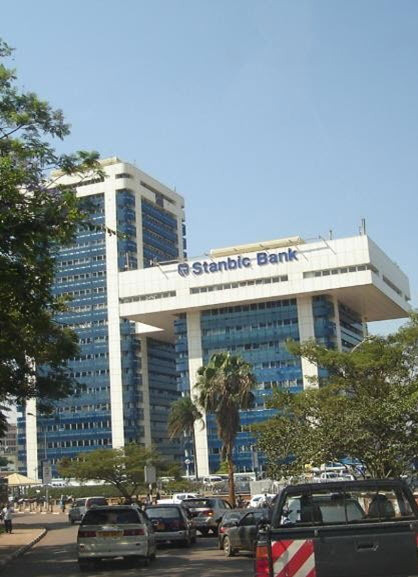 Preferably and also in Uganda the monthly payment from the capital to the projects will be done by a bank transfer. Depending on the internet security policy this bank transfer can happen online or as a paper transfer (via a letter or a cheque). 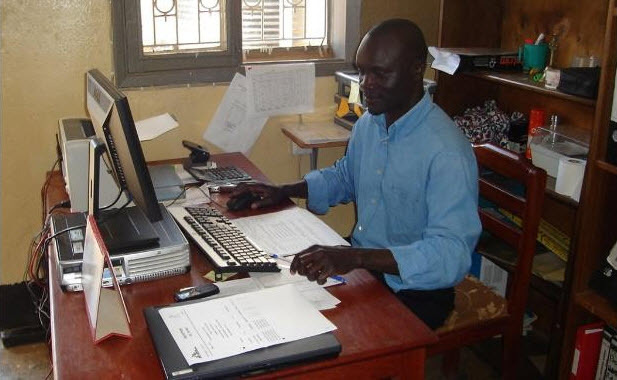 Always check with your ICT Officer first before deciding to shift from paper to online transfers. 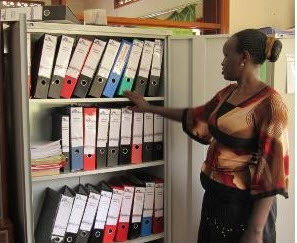 In both cases you keep a paper trail of the transfer for your hardcopy bookkeeping, and so will the Kitgum project. At capital level you make an entry in your Bank journal in BooX of the outgoing money. In Kitgum the Log Admin will also make a BooX entry in their Bank journal. The project will enter this as incoming money, but capital and project will use exactly the same description and account code in BooX to be able to reconcile the transfer in both journals. You will learn later on in this course how to make BooX entries. A cash transfer will happen from the capital safe to the field safe by using a Cash Transfer Form. 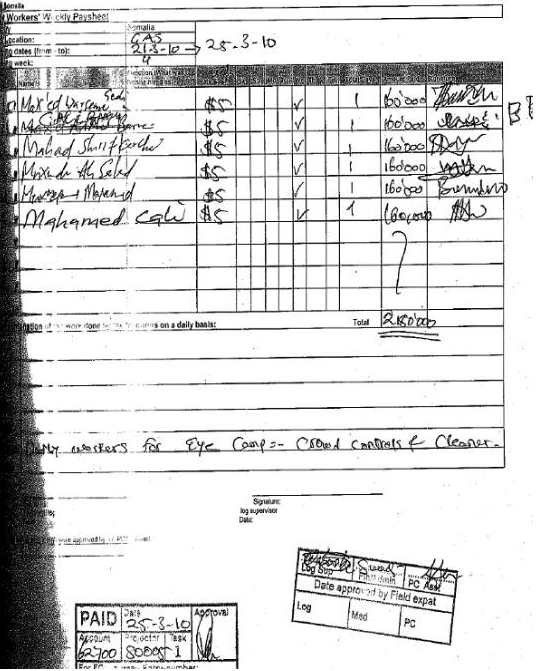 The signed copies of the cash transfer form are the paper trail of this money transfer. For the BooX entries the same comments as for a bank transfer are applicable, but the entries are made in the Cash journal. 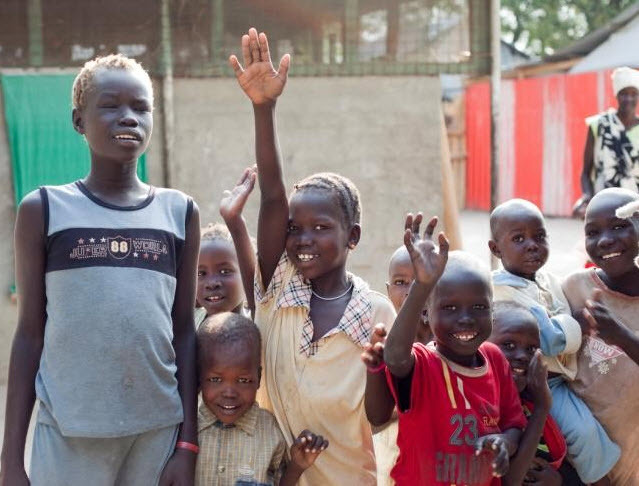 With cash transfers there are more safety issues and protocols that you come across. If a cash transfer happens often there will be a local procedure in place. This procedure will contain the authorized persons to initiate and transfer the money, the maximum amount, the frequency, the route and if someone should accompany the authorized person. 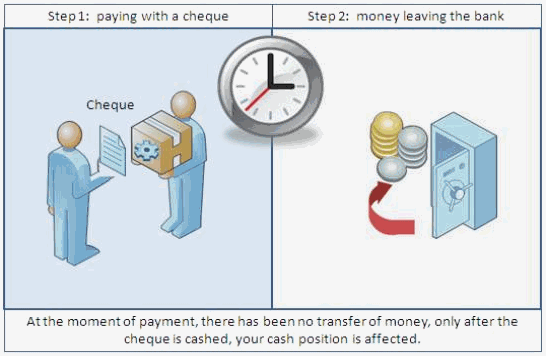 Also take a look at the procedure on Cash Transfer Between Field Locations. For a cash transfer you need a Cash Transfer Form. See below what the process looks like systematically. You need to have enough money in your safe to pay the suppliers, supply the petty cash box for your assistant, and maybe send money to the projects. Therefore you go to the bank to make a cash withdrawal. Make a reasonable calculation of the expected cash needs. 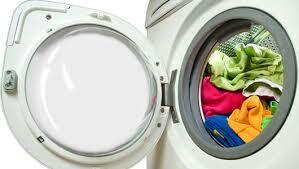 The amount withdrawn should not result in the maximum balance being exceeded. You write out a cheque with the needed amount of money to yourself. Before going to the bank you will make two copies for your own bookkeeping. You can find more information in the Cash Withdrawal from Bank procedure. When you make a visit to the bank there are some things you need to consider. Mainly concerning safety and not bookkeeping issues as much. Avoid a pattern and make your visits to the bank irregularly, so vary in time and day. Your visits should not always involve cash withdrawals. Inform just one other person in the office about your bank visit, who will look after your timely return. In most cases that is the HoM or another member of the CMT. If you go by car do not state &apos;bank&apos; as your destination. Avoid informing the bank prior to your visit, but when you have to, do pay attention to your communication lines. Always count the money at the bank, using the manager&apos;s office and not a public open counter. You are responsible for the main safe. Your assistant will also have a cash box; the cash box holds the petty cash that is used to pay for daily purchases and expenses. The money for this cash box comes from the main safe. So when the balance of the petty cash box is running low, your assistant will make a money transfer request using a Safe to Safe cash transfer form. This form is filled out in duplicate and signed twice, by the both of you. One copy is for the physical administration of the main safe and the other for the administration of your assistant&apos;s cash box. The transfer is registered in both Cash journals using the same description. Also here, you would register this amount as outgoing money and your assistant as incoming money. This amount is later on reconciled by using the same account code and description. During the actual money transfer you will both count the money together. The signature of you and your assistant is needed on the Transfer form to make the transfer. Never take out money from the main safe without signing a receipt. Of course there is also a policy available for the Safe to Safe money transfer. Also safe management (on how to deal with the main safe and its contents) is more a matter of safety than of bookkeeping related issues. As with most security related matters, safe management is a matter of common sense. Think about what you are doing, and keep in mind you handle a lot of cash in an insecure environment. When you arrive in your mission you make an overview of the safes in the mission and the person who is responsible for them. All bookkeeping staff should be aware of the financial policies and procedures in place. You will be implementing (new) procedures to make sure all cash keepers are doing a good job. You will instruct and train the bookkeeping staff in the mission on the procedures and give them written documentation on all the procedures they will need to follow. When you change something in the procedure, do not forget to inform everybody in the mission about this change! A part of safe management is key management. All safes in the mission should have a key (and no combination). National Staff are not allowed to take safe keys home and a spare key is always with the FinCo or the Log Admin. They should at all times have access to all cash boxes in the mission. Take a look at key management, a subpart of Cash and Safe Management. A short recap on the chapter to wrap it up. In this chapter we have looked at the cash flows in the mission and the money transfers that correspond with it. It is important to remember the different steps and checks you should take into account when you are dealing with a money transfer. Since you are handling a lot of money, most of the checks within cash management are about safety measures. It is good to keep that in mind when people complain that you are too strict with implementing forms and procedures. Next we have prepared two exercises to see if you have understood the content of this chapter. Your assistant has handled a lot of cash payments this morning. And now he is running low on cash. He asks you for a refill for his petty cash box. You will withdraw money from the main safe to supply your assistant with enough money for the rest of the week. Can you describe the steps that are involved with this action? Write the steps down on a piece of paper. Your assistant will make a money request by filling out two copies of the safe-to-safe cash transfer form. When you receive this request you will first assess the money needs of your assistant. You will make a realistic estimation of the amount of money he needs for the rest of the week. With this estimation also take into account the maximum amount the petty cash box is allowed to contain. This amount must not be exceeded after the transfer. Count the money for the transfer from the main safe to the petty cash box together. It is best to do this in your office with a locked door. After counting, you and your assistant both sign the two copies of the cash transfer form. Both you and your assistant will enter the transfer in the corresponding cash journal in BooX. You both use the same description for this transfer. Both file the Cash Transfer Form. After you provided your assistant with money for his petty cash box, you notice that the main safe is running low on cash as well. You decide to go to the bank. Describe what steps to take and what you keep in mind when you take a trip to the bank. Assess the money needs of the mission and make a realistic estimation of the amount of money you need. 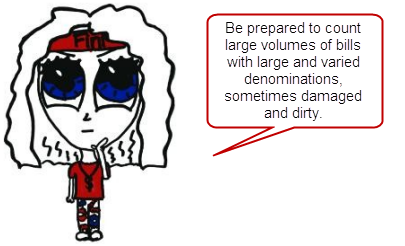 With this estimation also take into account the maximum amount the main safe is allowed to contain. This amount must not be exceeded after the money withdrawal. Write out a cheque with the right amount to yourself. Never sign a blank cheque. Make two copies of the cheque for your administration. Before going to the bank inform your HoM (or another member of the CMT) of your departure. 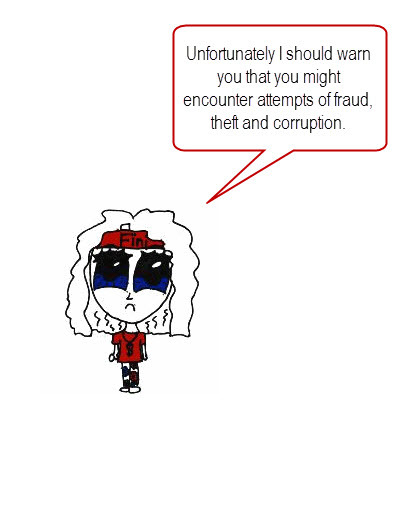 Be cautious to inform more people or the bank about your trip. Go by car but do not put &apos;bank&apos; as your destination. Avoid patterns and take into consideration on what day and time you go to the bank for a cash withdrawal. Count the money at the bank in a closed office. Inform your HoM when you are back from the bank. Enter the money withdrawal in your cash journal (incoming money) and in your cheque book (cheque payment, so outgoing money) in BooX. File the copies of the cheque in your hard copy administration. The next chapter will deal with checking receipts and invoices. As a FinCo one of your main responsibilities is to check and control all expenses in the mission. Therefore you will have to check all incoming receipts and invoices and see if they are compliant with our standards. In this chapter you will learn how to organize yourself and what you should check for. You will also discover why checking invoices accurately is so important and what can happen, if checks are not carried out properly. According to the job description one of the tasks as a FinCo is to ensure completeness and correctness of financial administration. In practice this means you are responsible to check the day-to-day bookkeeping of the projects and at Capital level. At Capital level you usually have an assistant to help you out with most of the basic bookkeeping tasks. Projects are in charge of keeping their own bookkeeping. This is done by a Log Admin who is working at project level. Every month, the project sends the hardcopy receipts as well as the BooX bookkeeping to the Capital to be checked by the FinCo. It is important that you check the invoices and receipts and make sure they meet our standards. As MSF we have committed ourselves to be as transparent as possible. This commitment includes keeping an overview of receipts and invoices that can easily be audited by our internal and external audit teams. So for all expenses we keep records in the form of invoices or receipts. You will check if the information on the receipt is correct. And also if the expenses are in line with MSF financial policies. Furthermore, because of internal control regulations, all receipts should be in English. Is there a (the correct) date on the receipt/invoice? Is the amount that is paid, or needs to be paid, clearly listed on the receipt/invoice? Is there a description of the items or services purchased, clearly written in English on the receipts? Is there a signatory from the persons responsible indicating the items or services were actually delivered? Is there a signatory of the PC or delegated staff member authorizing the payment? 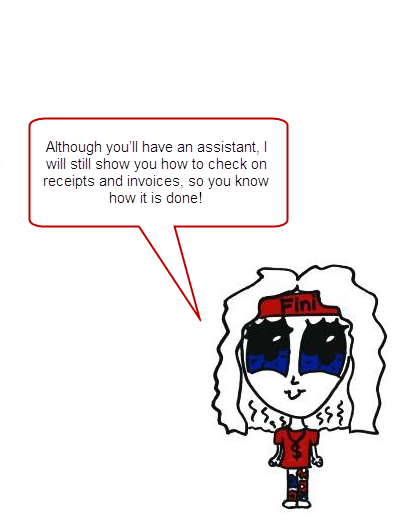 Fini has some examples she wants to show you, and she would like to check them with you. 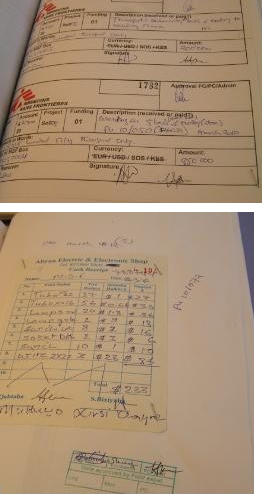 On this page you see an example of a receipt from Somalia. Have a close look at it and think of the steps of the previous page. 1. Is the date present? Yes, 28-03-10 on the top left. 2. Is the amount clear? Yes and no. It is clear that we have paid 34. But 34 of what currency? 3. Is the description of the items clear? Yes, this is sufficient. 4. Is there an approval signature from the Log? Yes, it seems in this case they have a specific stamp they use at the bottom. It is bit hard to read, but the Supply Log has signed for reception. 5. Is there an approval signature from the PC? Yes, on the same stamp you can see the PC has signed. 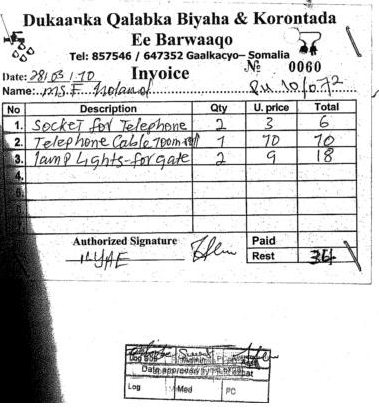 Here you see another example of a receipt from Somalia. It&apos;s from our project in South Galcayo. Let&apos;s perform the checks. 1. Is the date present? No, there is no date on the receipt. 2. Is the amount clear? Not really, I cannot make out the currency. 3. Is the description of the items clear? No, I think it says "10 days" but it is unclear what this means. 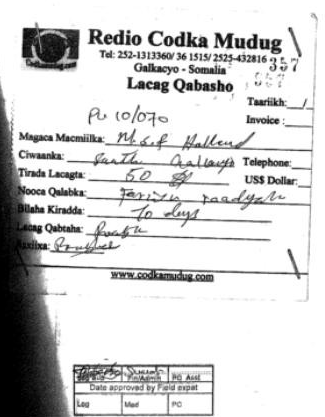 The receipt is mainly in Somali, and that is not English. 4. Is there an approval signature from the Log? Yes, it is on the right place on the stamp. 5. Is there an approval signature from the PC? No, on the same stamp you can see the PC has not signed. An example where an MSF receipt was used. Let&apos;s check the receipt. 1. Is the date present? Yes. 3. Is the description of the items clear? Pretty clear, although the date the labor was performed is a bit hard to read. 4. Is there an approval signature from the Log? No, cannot find it. As this is labor for cleaning of the exam room, it might be someone else signing that the labor actually happened. It is unclear who this is. 5. Is there an approval signature from the PC? Yes, on the top right corner. ready, you can compare your answers with mine. 1. Is the date present? 2. Is the amount clear? 3. Is the description of the items clear? 4. Is there an approval signature from the Log? 5. Is there an approval signature from the PC? What feedback would you give the purchaser? Have a look at this receipt and perform all checks needed. Also list what feedback you would give the purchaser. Move your cursor to the upper right of the receipt and click to magnify. Check 1: No date that you can read. Check 2: Not clear what the total amount of money is that was paid because there is no currency mentioned. 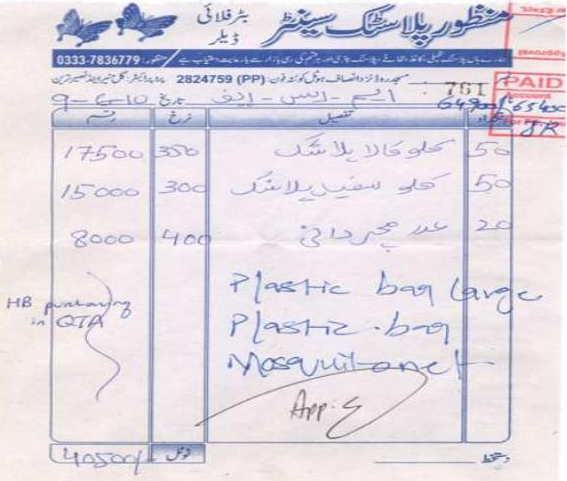 Check 3: The receipt is written in Urdu or maybe Pashtu. 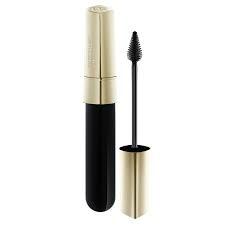 It is very good the items are translated in English. Check 4: It is unclear if the log signed for reception of the goods. Check 5: Unable to find the signature of the PC or delegated person. 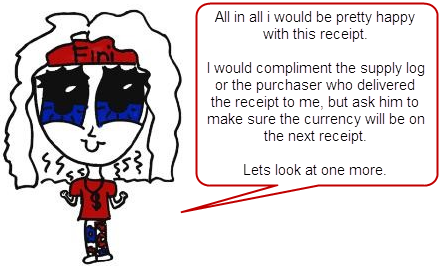 Our feedback would be that the purchaser should add the date, the total amount and the currency. Next to that you would check if the items were received, and sign for it. If it is not your job to do so, you would ask the person responsible to do so and you would, politely, explain the procedure again. This is a daily worker sheet, dealing with payment of day laborers. Check 2: No currency but the rest is clear. Check 3: Clear, it seems that the work was done for the eye camp, crowd control and cleaning. Feedback: You would only ask to mention the currency next time. For this time, you would fill in the currency yourself. 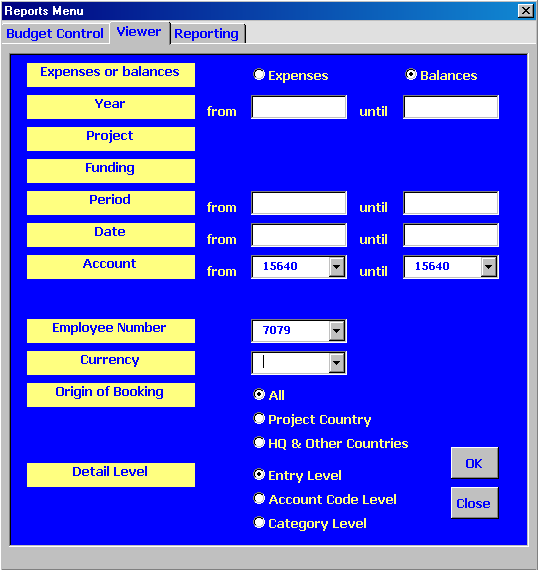 All invoices are filed at project level in a A4 binder. At the end of the month the projects will have sent their files to the Capital. At Capital level it is the task of the FinCo to check the invoices and the BooX entries. Not only will you check if the receipts are according to MSF standards, you will also make sure that the expenses are in line with MSF financial policies. 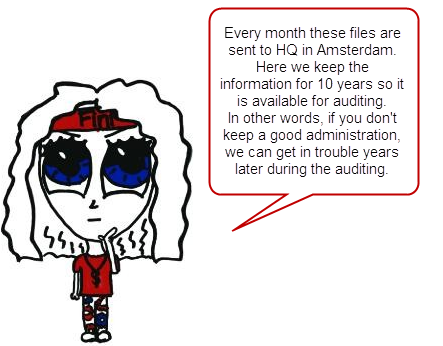 After double checking the bookkeeping of the project, you will send the files to HQ in Amsterdam. There they will be archived. On your right you see some pictures of how receipts are filed. It is important to have receipts documented and filed in an orderly way. These receipts are the basis of our financial administration. Every invoice or document that is related to an entry in the bookkeeping system should be traceable. This is required for the annual audit for example. To link each transaction in BooX to an original receipt, every receipt should have a MSF bookkeeping stamp clearly and completely filled in. 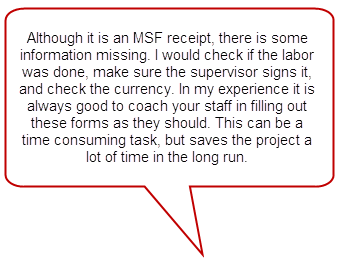 Using the MSF bookkeeping stamp should allow you to refer to the journal entry of the receipt. Place the rubber stamp on a blank area on the invoice so the information on both the stamp and the invoice are still readable. The stamp should be filled in by the person handling the cashbook and approved by the Log Admin or the PC. 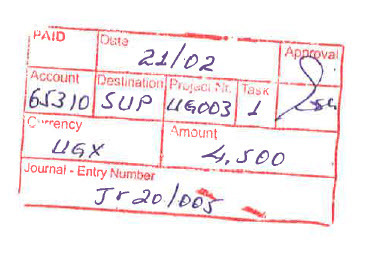 See below an example of an MSF bookkeeping stamp. Now you can check receipts and invoices to see if they are done according to MSF standards. And you can file these receipts the MSF way. In the next chapters you will learn how to make entries in BooX. In the previous chapter you learned how to check receipts and invoices according to MSF standards. The next step is to enter these amounts in BooX. In this chapter you will get familiar with the BooX program so you are able to handle your bookkeeping. 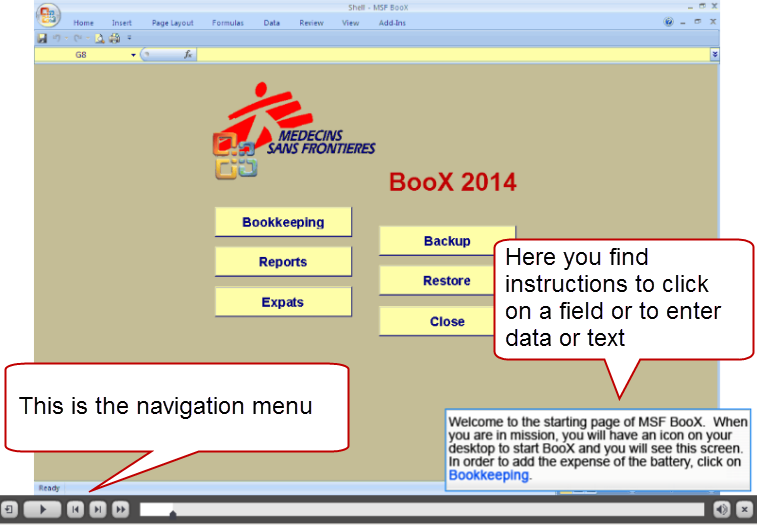 In the previous chapter, you have learned to check invoices and receipts according to MSF standards. 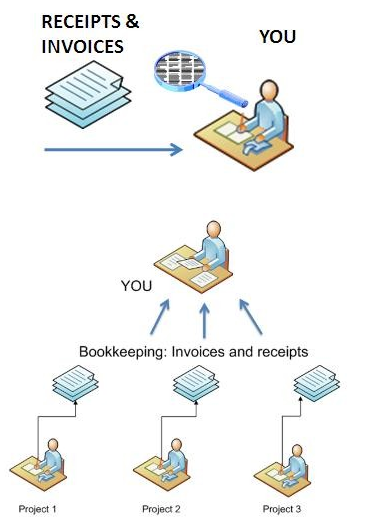 The next step in the bookkeeping process is entering them in our bookkeeping software, called BooX. Next to the digital administration, kept in BooX, there is the physical administration of all receipts and invoices in a binder. These two forms of administration help the mission keep an overview of the spending of the mission and its projects. Bookkeeping and administration is used to keep the expenses insightful for the project, the Capital, HQ in Amsterdam and to our donors. 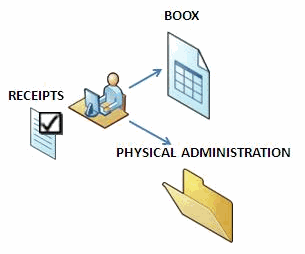 At project level a Log Admin will be responsible for bookkeeping and entering receipts in BooX. At Capital level you will probably have a FinCo assistant to help you out with the BooX entries for the day-to-day expenses. The exercises during this chapter will show you examples of entries with a relatively small amount, but as a FinCo you will most likely be dealing with larger amounts of money, like cash withdrawals from the bank and salary payments. BooX is a very basic Excel-based tool. 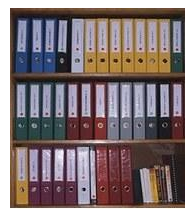 The BooX program consists of different journals which will help you to organize your bookkeeping. These journals represent different bookkeeping sheets for each month for a specific cash flow. So, for example, you have a journal which is an overview of all ins and outs for your Euros. There are different kinds of journals in BooX. Cash accounts and bank accounts have different journals. Each currency has its own journal. A description of the type of journals available in BooX can be found in the BooX manual that is installed on your field computer. Every journal shows the cash flow of one month. A journal shows how much money there is at the beginning of the month, how much you have spent and on what you have spent it. At the end of the month each journal is closed. Closing the month will clear the bookkeeping sheet and start a new period. Each expense account code has been assigned a default destination code in BooX. This is the destination code which is most often associated with the type of expense. Medicines, for example, have OPS as a default destination because the bulk of medical purchases are made for the purpose of helping the beneficiaries. The destination should be changed if the default is not correct. The destination codes allow us to report our costs in a manner different than account code, e.g. to see the total expenses for maintaining expats in the mission. Entering the account code and destination correctly is important because the amounts are deducted from that sub part of the budget. Otherwise, reports that track expenses to budget will not be accurate. 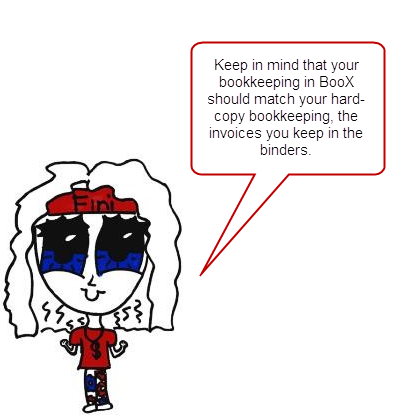 Before we continue there is one more thing you need to know about our bookkeeping system. We have a standard Chart of Accounts in MSF. On this chart you find the different "headings" we use in our budget system. When we make a budget (this is done every year), we divide it into smaller parts, called accounts. For example: we have an account for drugs, called "60000 Medicines". 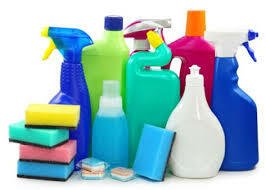 We have another account for office supplies, called "61220 Supplies & Stationery". Click on Chart of Accounts, to see a list of the new accounts to be used effective 2014. In addition to the account code, a corresponding destination code must be given for each expense transaction booking. The destination code indicates the ultimate purpose of the item purchased, as opposed to the account code which indicates the nature of the item purchased. 1) OPS – Operational: Expenses which have a direct link to the beneficiaries – the primary purpose of the purchase is direct support to our operational mission. 2) SUP - Administration & Support (Overhead): Ongoing expenses for goods and services needed to run our operations, which are not of direct benefit to our patients. Office costs, both in the capital and in the field locations, are a typical example. 3) EXP - Expatriate Staff: All costs which can be directly attributed to the housing, transport, salary/benefits and daily life of expats both in the capital and field locations. 4) NAT - National Staff: All costs which can be directly attributed to the housing, transport, salary/benefits and daily life of national staff both in the capital and field locations. Whenever you make an entry in BooX you are asked to enter the account code and destination. For example, drugs specifically for expat health such as anti-snake venom serum is booked to account code 60000 Medicines, destination EXP. If drugs are purchased for use in MSF clinics, then the expense is booked to the same account code 60000 Medicines but to destination OPS. In the rest of this chapter you will learn how to make entries in BooX...so how to update the journals. In the modules of the current training when you are working in BooX you are dealing with expenses and entries on project level. As a FinCo at capital level you will most likely be dealing with larger amounts, but the idea is the same. As was explained to you in the general introduction, you are working in the Uganda mission. Surprisingly they accept Euros in this part of Africa! (Just for this exercise, so if you are going to Uganda, don&apos;t think you can do with Euros only). As mentioned every cash flow has its own journal. This means you have a journal for Euros and one for Ugandan Shillings, but also a separate journal for you (main safe) and one for your assistant (petty cash box). Today you find on your desk a receipt for a N70 Battery that was needed to repair one of the vehicles. 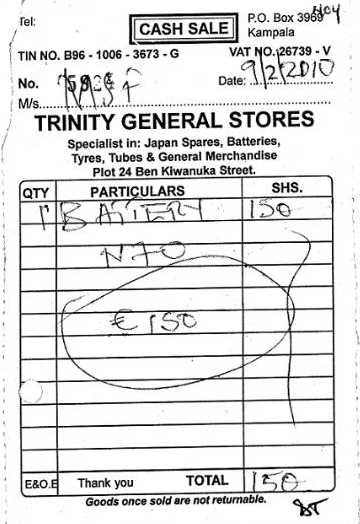 The amount of €150 that was spent on this battery should be entered in the corresponding journal in BooX. When you open the bookkeeping module in BooX to do your bookkeeping you first have to select the appropriate journal. After that you will see a journal sheet in which you can make an entry. Here you see a page of a bookkeeping sheet in BooX. As you can see it has the basic layout of an Excel sheet. There are different blue buttons you can use to perform different actions. The yellow bar provides you with some information about this journal. You see the name of the journal, if it is a bank or a cash book, and what period it is. You also see in the journal sheet the opening balance and the total amount of entries. On the next page you can see what information you need to make an entry. When you click on the MAKE ENTRIES button, you will see the entry form for the BooX journal. Date: here you fill in the date that is on the receipt. Description: a short but clear description of the expenses that have been made. Amount: the amount of money that has been spent. Account: every payment needs an account code. These codes group all the costs and provide a description of the costs to make them uniform and insightful. Destination: the ultimate purpose of the item purchased (EXP, NAT, OPS, SUP). Project: the project code of the project you are working in. Funding: funding indicates where the money that is spent, is coming from. If you work in an OCA project, you will typically always fill in MSF H unless HQ directs the mission differently. The first three fields have free entry, you can decide how to fill them in. The last four fields in BooX have a drop down menu where you have to choose. If you are done you click OK and Close to enter the entry to your bookkeeping sheet and close the entry form. You can practice by starting the simulation on the next page. Congratulations, you have just made your first entry in BooX. So far we have dealt with situations where you (or most likely your assistant) have made a payment in cash to a store. The purchaser has brought back the receipt, and you update your bookkeeping accordingly. Another situation you will encounter requires transferring money from one journal to another. The following happens often. Let&apos;s say you have an assistant who handles the petty cash used for small purchases and advances. To make sure your assistant has enough in the cash box, you need to give him or her some money once in a while. As the money is not leaving the organization, but just moving from one place to another, we call this a transfer. Your cash box (usually a safe) and the one of the assistant are represented by different journals. 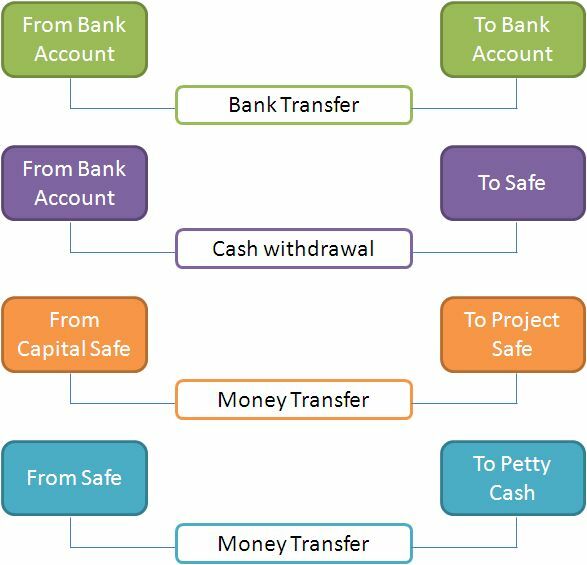 Transfer of money in the same currency can take place from a bank account to a cash box, from one bank account to another, or from one cash box to another. When you make a cash transfer, you do almost the same as you have just practiced. One important difference is that you have separate account codes for cash transfers. Expenditures are 6XXXX and transfers are 2XXXX. You can find the right account codes in the Chart of Accounts. In the second part of this chapter you will learn to make a cash transfer. But first let me introduce you to your assistant! As a FinCo you will most likely have a FinCo assistant. An assistant will handle your daily financial administration. The assistant also will control some petty cash to handle purchases. Having an assistant creates a new cash flow and therefore also a new journal. After a thorough selection process we have selected Yoweri as your assistant. It is your job to train the FinCo assistant and other National Staff members who will make entries in BooX. You will also have your own capital journals to which you will need to manage. In the next exercise you would like to give your assistant €300 in cash to start with. First you will enter the outgoing cash in your own journal. Secondly this amount needs to be entered as incoming cash in the brand new journal of your assistant. It is important to note that the assistant is responsible for maintaining the journal. So normally he will make all entries himself and you would only attend to the outgoing money in your journal. For educational purposes you will now make both entries, to show the difference between an incoming and an outgoing cash transfer. Like we indicated in BooX this amount of 300 Euros is a money transfer. It is transferred from one journal to another. So this same amount should also be entered in the journal of your new assistant as incoming money. Normally Yoweri will make this entry himself, because he is responsible for updating the journal. Don&apos;t forget that you have to give him the actual money as well! Keep in mind the procedures and safety measures we discussed in the chapter on Cash Management. You should both count the money and sign two copies of the form and file the form in the binder that corresponds with the right journal. The entries you make in BooX are mainly costs that occur in the project. This is outgoing money that was spent in the field. So when you make an entry in BooX, the program indicates the amount as a cost, and therefore as outgoing money. If you receive money, you should indicate that it is incoming money by adding a minus before the amount. I think it feels a bit like a contradiction to add a minus for money that you receive. But that is how you indicate in BooX that it is the opposite of a cost. As you already have seen in the previous chapter there are policies within MSF regarding cash transfers in field locations. You already have made three cash entries so far! In no time you will be able to do them with your eyes closed. Figuratively speaking of course! While working with BooX there are a few things you should take into account. First you should realize that every cash flow has its own journal. The BooX journal is a reflection of your current funds and what you have spent in real life. 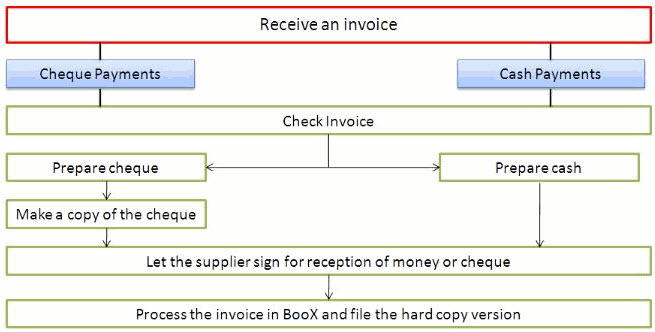 So carefully check the invoices before entering them in BooX. It is important that you noticed the difference between a cash transfer and expenses during this lesson. The difference between a cash transfer and an expense is indicated by the use of different account codes in BooX. Bookkeeping is mainly about spending money. From time to time you also will receive money so you can still keep on spending it. This incoming money is also entered in BooX, but with a minus added to the amount to indicate that is is not a cost but money that you have received. The cash balance on your journal sheet should match the amount of money you actually have in your cash box. To check if that is the case you, and everybody who is responsible for a safe or petty cash box, will perform a cash count from time to time. At least once a week but preferably on a daily basis. At the end of the month and when there is a handover of safe or petty cash box, there is an extra cash count. This extra cash count requires two parties to count and to sign the cash count form. At month end you will supervise the cash count and also check the journal of your assistant. After you perform a cash count you check it with the cash balance in your journal. You should enter your cash count in BooX. The BooX sheet of the cash count should be printed out. The hardcopy journal of a cash book should include a signed statement of the final cash count. You could discover a discrepancy between the journal and the cash box. 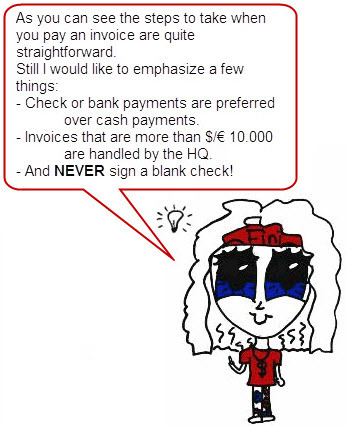 First you should check if you miscounted the cash or forgot to enter an invoice. If that is not the case, then you try to find out what caused this discrepancy and try to correct it. If you cannot solve the difference you enter it in BooX to correct the end balance in the journal and you give a proper justification for the disparity. In the simulation on the next page, we will perform a cash count in BooX. There can be many different reasons for a cash disparity, like a counting error, rounding, wrong bookkeeping entry, a receipt that is lost, or anything else that you can think of. But it must not be taken lightly. It is expected that the cash keeper investigate a discrepancy thoroughly. 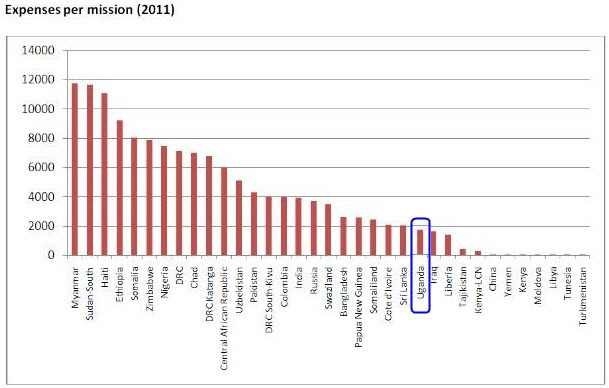 In some countries where corruption is more prevalent, cash disparities need to be monitored more closely. 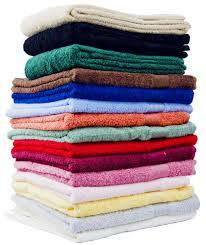 One of your tasks as a FinCo is therefore also to determine a policy on the maximum amount for a cash disparity. This amount can change per mission. Disparities that exceed that amount or are more than (an equivalent of) €2500 should always be reported. This incident report, written by the cash keeper, goes via you to the Head of Mission. A cash discrepancy caused by theft is handled the same way as a loss. Everything above €2500 should be reported. It is also entered in BooX but using a different account code (67020 in the 2014 CoA). The incident report is part of the hardcopy administration. See also the policy on Theft & Losses. Please try to answer the following questions in your own words and write them down. What is a journal in BooX? What information do you need from a receipt to make an entry in BooX? How do you indicate in BooX the difference between an expenditure and a money transfer? Here are my answers, please compare them to your own. 1. What is a journal in BooX? A journal is a bookkeeping sheet in BooX. A journal should represent a clear overview of the spending and revenues of a cash flow during the month. Every project has different journals for bank accounts and cash boxes. 2. What information do you need from a receipt to make an entry in BooX? The first three fields of an entry are also stated on a receipt. The date, a description and the amount. Next to that you need to fill in the budgetary information in BooX (account code, destination, project and funding) but these are not on the receipt. 3. How do you indicate in BooX the difference between an expenditure and a money transfer? A transfer is when you move money from one place to another, so not actually spending anything. For expenditures you always use an account code starting with 6XXXX. (60000 for Medicines and 61220 for Supplies & Staionery, as in the 2014 CoA). Money transfers are indicated by using an account code starting with 2XXXX. Now you are able to start working with the BooX program. In the next chapter you will learn how to make bank entries in BooX. In the previous chapter you have learned how to make cash entries in BooX. Besides the cash payments you will also use BooX for all the cheque and bank payments. To keep track of these payments you will have to use two journals in BooX: a cheque journal and a bank journal. 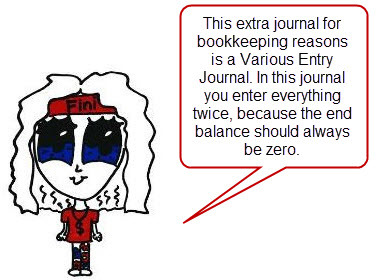 In this chapter I will explain why you need these two journals to make cheque and bank entries in BooX. There are not always banks available in the areas where we work. If bank accounts are hard to come by, all payments are done in cash. Yet where banks are available bank payments are preferred over cash payments. All payments above €250 should ideally be done via the bank. Payments done through bank accounts are safer and more accurate. Working with bank accounts decreases the chance of theft, cash differences, and inaccuracies. 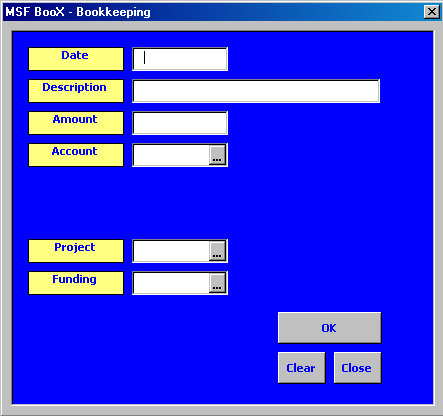 In the previous chapter you made cash entries in BooX, the MSF bookkeeping program. Now you will learn how to make bank entries. 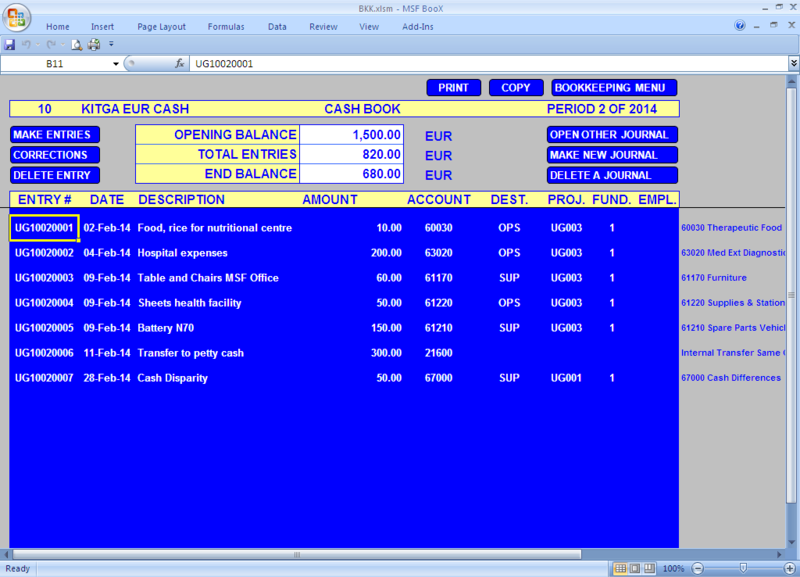 The bookkeeping sheet of the cash and bank journal look the same and making new entries works the same way. An important difference between these two is that payments through a bank account usually work via cheque. Writing out a cheque has an effect on your administration and in this chapter you will learn how. If you do not pay in cash, you will write out a cheque. The moment you write out a cheque you have paid for the expenses. While the cheque has not been cashed yet, the outstanding amount is still in your bank account. So when you pay for your expenses by cheque, it does not immediately affect your cash flow. Because of the time difference between the payment by cheque and the moment the cheque is cashed, you have two journals to keep track of the payments. This is the main difference between a cash payment and a cheque payment. In this chapter you will see how this affects your bookkeeping. When you make a payment via a cheque you enter this in your cheque journal in BooX. Below you see an example of what a cheque that is used in Uganda looks like. You use the bank statements to do your bookkeeping. A bank statement is an overview of payments of your bank account provided by your bank. Look at this example of a bank statement. As you can see some of the lines say CHQ. That means that these amounts are cash withdrawals or payments made by cheques. Payments by Cheque and Bank Transfers. There are two different journals that you have to keep updated while managing your bank account and your BooX entries. You have a journal for the bank bookkeeping and a journal for the bookkeeping of the cheques. When you issue a cheque, the same day you will make an entry in the cheque journal. In this journal you keep an overview of the cheques you write out during the month. At the end of the month you will update the bank journal according to the bank statement you receive from the bank. If the issued cheque is on the bank statement this cheque is cleared. If the cheque is not on the bank statement it is still pending. In order to get the bank journal and the cheque journal to correspond to each other, it is important to always mention the cheque number and to use the right account codes. Before you start to work with a cheque journal it is important to note that a cheque journal is different from the ordinary cash and bank journals. A cheque journal requires a double entry for every cheque that is issued. You keep the invoices of the expenses together with your cheque journal as a reference. The bank statement is the reference for the bank journal. 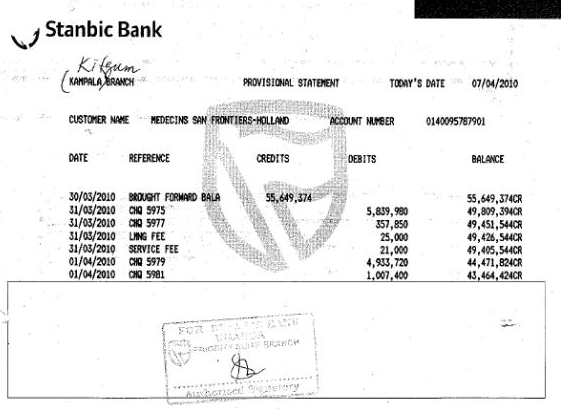 On the following pages, you will see an example of a cheque and the corresponding bank statement. Of course you will try to enter them in BooX. You are still working in Uganda in the Kitgum project. They also accept cheques in Euros. Today you write out a cheque for one hundred and fifty Euros for Eagle Motors to repair one of the vehicles. You see the cheque here. Like I previously explained you should keep track of all the cheques you write out. After issuing a cheque you will enter this cheque in BooX on the same day. Only at the end of the month will you match the outstanding amount in your bank journal. So first we will enter this cheque to Eagle Motors in your cheque book. Please realise before we get started that a cheque book is a special journal (a various entry journal). 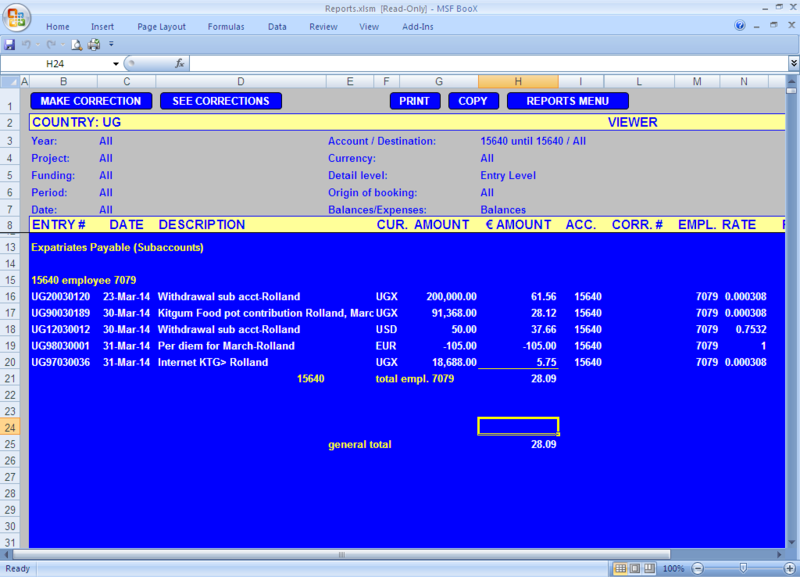 You will learn what that means from the next page as you will enter this cheque into the cheque journal in BooX. You entered the cheque 7917 in the cheque journal. You used two entries with different account codes to do so. At this moment the balance is zero since we entered €150 and minus €150. One entry with the account code 6XXXX was entered to describe the nature of the costs as an expense. The credit entry (minus €150) with account code 15630 was made to indicate that it is an outstanding cheque. 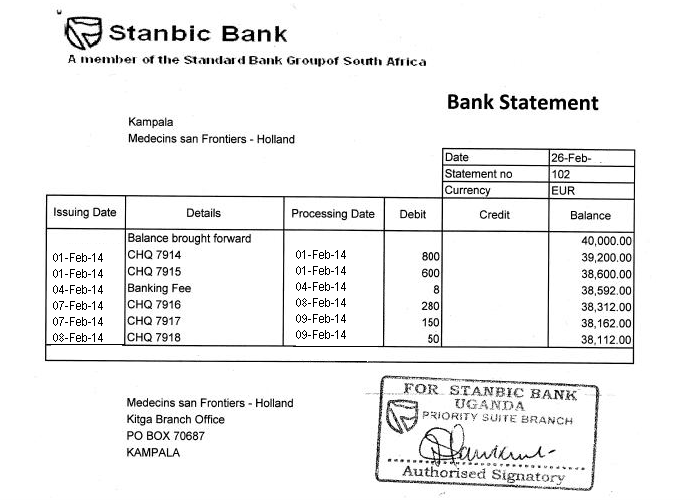 At the end of the month we will update this balance if the bank statement shows that the cheque was cleared. Until the bank journal is updated, the amount of €150 is outstanding. Cheques that show on the bank statement are entered in the bank journal as cleared outstanding cheques. 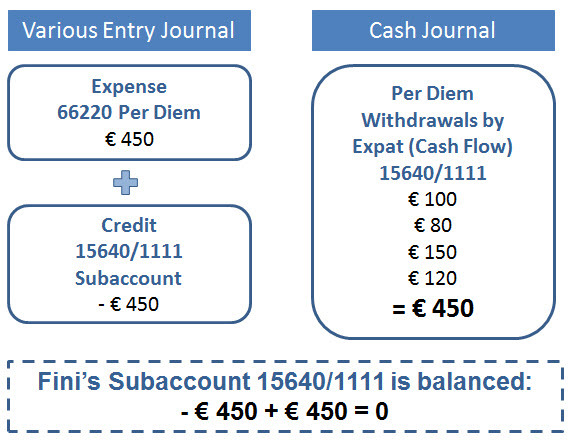 The entry in the bank journal will balance the 15630 entry in the cheque journal. that corresponds with the first issued cheques of February. You keep the journal for bank payments updated using the bank statements. It is important to start your journal sheet every period with the same amount that is on your bank statement. In order to achieve that, it is equally important to end the month with the same amount that is on your bank statement. The opening and end balances should match the accounts on the bank statements, because that is the reference for HQ. As you can see on the previous page, cheque 7917 is cleared. At the end of the month you will enter all cleared cheques and other expenses from the bank statement into the bank journal in BooX. Unlike the cheque journal, you only make one entry instead of two in the bank journal. Cleared outstanding cheques (cleared o/s cheques) always have the account code 15630, no matter what the money was spent on. Try it yourself in the simulation on the next page. You should enter all lines in the bank statement like this. With the new Chart of Accounts (CoA), all cleared outstanding cheques will use the account code "15630 Outstanding Cheques" in the bank journal. Additional costs like banking fees will use "65710 Bank Charges". These kinds of expenses are not entered in the cheque book, they should always be booked straight into the bank journals. So please pay attention to this. As you have noticed, we made two entries in the cheque book journal and one entry in the bank journal. We used the account code 15630 in the bank book for the €150 and we entered minus €150 in the cheque book journal with the same account code. In the end these amounts balance each other out. Only the €150 entry in the cheque book with account code 65120 Maintenance of Vehicles (what really describes the expense) is left. Let&apos;s go through the steps one more time just to summarize. This exercise consists of only two questions. Take the time to write down the complete answer for yourself before checking the answer on the next page. 1. When do you update the cheque journal and bank journal? 2. Why do we need two journals when making a cheque payment? You update the cheque journal on a daily basis, when you have handed out a cheque. The bank journal is updated according to the bank statement that is provided by the bank. You receive a bank statement every month and you will update the bank journal on a monthly basis, before you close the period. The moment you write out a cheque you have paid for the expenses. While the cheque has not been cashed yet, the outstanding amount is still in your bank account. So when you pay for your expenses by cheque, it does not immediately affect your cash flow. Because of the time difference between the payment by cheque and the moment the cheque is cashed, you have two journals to keep track of the payments. You need two different journals, but you also use different account codes. In the cheque journal you make an entry with a 6XXXX account code that describes the nature of the costs. Next to that you make a credit entry with 15630 to indicate that it is an outstanding cheque. If the bank statement at the end of the month shows that the cheque was cleared this amount will be added to the bank journal. Cheques that show on the bank statement are entered in the bank journal as cleared outstanding cheques. The entry in the bank journal will balance the 15630 entry in the cheque journal. Now you are able to work with the BooX program. In the next chapter you will learn how to administrate salary payments. A major expense in the field is the salary for national staff. The administration and payments of the national staff salary is one of your responsibilities. BooX is also used to keep the administration of the salary payments to national staff and the payments to the authorities. The project is responsible for salary payments to the national staff. Mind you, only for the national staff, the payments of the expat salary is handled by the HR department in Amsterdam. So you will not be responsible for handling your own salary. Like it is with all expenses, it is important to have a clear bookkeeping of the salary payments. You need two programs to make the salary payments; Homere, which will provide you with the HR payroll information and BooX in which you will use two different journals to do the bookkeeping. Salary payments are made to two parties. We pay a net salary to the national staff, but we also need to pay income taxes and social contributions to authorities. To be able to keep the different payments of the salaries visible as one cost in the bookkeeping, you will use two journals and different accounts for the administration in BooX. In this chapter, we will explain this in detail. You already practiced with BooX in the previous chapters and also in this chapter BooX will be the main program you work with. Although you will need the information from Homere we will not pay much attention on handling Homere. Homere is the program that holds all the HR information of the national staff. You need this program to provide you with a monthly payroll. You will export this information from Homere to an Excel sheet. The information from the monthly payroll is necessary to pay the salaries and to make entries with the right account code in BooX. Working with Homere will not be a part of this module. Best to ask the HRCo in your mission if they can explain Homere to you and how to retrieve the payroll information. During this chapter we will provide you with the payroll information from Homere in an Excel sheet. Since you are already at the end of the Finance module, we don&apos;t have to explain a lot about BooX. Still there are some things we would like to point out. You will need to use two different journals in BooX to keep an overview of the salary payments for the national staff. Like we also use two different journals for the administration of the cheque payments. We pay the net salary to the national staff and later on the withholdings to the authorities. National staff is usually paid at the end of the month. The tricky thing is, that the withholdings to the authorities are usually paid later, so after you have closed the month. This can be confusing, yet the solution is quite simple. You use your regular cash journal for the actual payments, and next to that you have (yet another) journal that helps you keep track of all salary related costs. So, this extra journal is only used for bookkeeping reasons, it does not represent new, or other cash flows. We will explain a little more and we are going to practice in a while. To make it more clear you can split the salary payments into two steps: The preparation and the actual payment. The first step is the preparation of the monthly payroll. You will use the information from Homere to split the gross salary into the net salary for the national staff and the taxes for the authorities. Exporting and editing the payroll from Homere is the first part of the preparation. After that you will enter these amounts in BooX by using a Various Entry Journal. You used such a journal for the administration of the cheques as well. The end balance of this journal should always be zero and is kept for bookkeeping reasons only. The national staff is getting paid at the end of each month. Some projects pay out a salary advance as well. This is a part of the salary that already has been paid to the national staff earlier in the month. Therefore this amount needs to be deducted from the net salary payments we make at the end of the month. The rules and regulations for paying salary advances are different in each project. The salaries are paid in the national currency and often in cash. During this chapter you are still working in Uganda so you will pay the salaries in Ugandan shillings that is indicated as UGX. Usually we pay the withholdings to the authorities the following month, but in some missions you will pay taxes quarterly. The payments are being booked on the date you actually hand out the money. So if you pay the February salary taxes in March, you will book it in your March cash journal. Your payroll preparations in February using the Various Entry Journal will match these payments in March to the February expenses. First we will start with the preparation of the salary payments. The bookkeeping sheet with the payroll information from Homere is your guideline during this preparation. But this also needs some preparation in itself. The Excel sheet that you get after you have exported the payroll information from Homere to Excel is not immediately a clear overview. All the information is there but it is easy to get lost in all those numbers of expenses and costs centers. In the Homere Excel sheet you will find several amounts that you need to enter in the two different journals. It is therefore highly recommended that you make an overview yourself in Excel which clearly states the credit and debit journal entries and the corresponding account codes. If you do this carefully, you will see that this overview lists all the entries you will have to make in BooX. Having all your entries clearly listed decreases the chances of making mistakes, because you are able to check the amounts you need to enter beforehand. 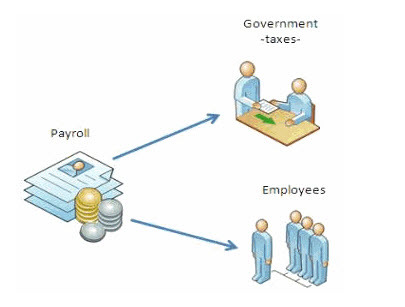 In this chapter, you will receive the payroll information as a clear Excel overview. If you would like to see an example of a payroll overview from Homere, please click MSF 2\FCC\Excel Homere.xls. 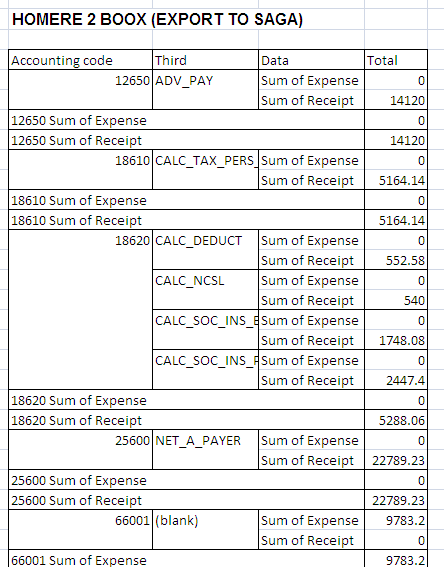 After you edit the payroll information in Excel it should look something like this Excel sheet. Presenting the information from Homere like this will give you an overview of all the credit and debit entries in the different journals. The account codes that you will use in BooX should be clearly listed on this overview. In this chapter we will go through the amounts on this Excel sheet and enter the national staff salaries in BooX. 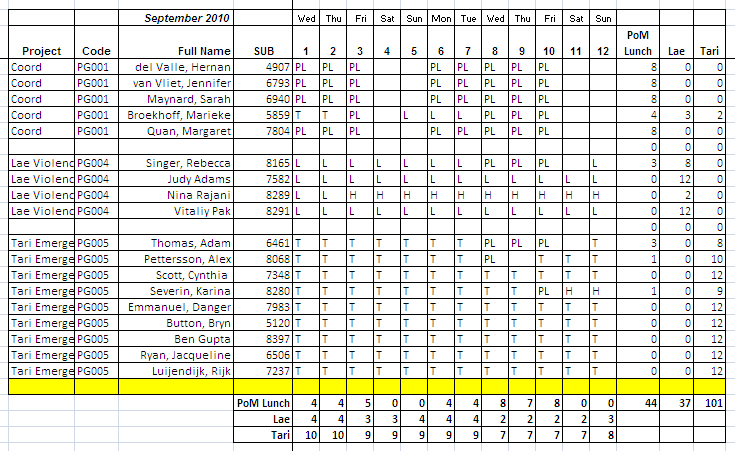 You will need this Excel sheet for the several entries. The first part of the Excel overview are entries for the Various Entry Journal. In the Various Entry Journal you need to split up the gross salary into the withholdings, the net salary and the salary advances. You use this preparation of the salary payments in BooX also to reserve the money you are obligated to pay. You need to pay the national staff and the authorities. The national staff will receive their money at the end of the month. The authorities you need to pay later, after you closed the financial month. To indicate that these costs, although paid for in a different month, are still costs that belong to the February salaries, you use the Various Entry Journal to reserve this money in February. Please take a closer look on the Excel sheet on the previous page. The first entries are the salaries divided into the different staff functions. You need to use the corresponding account codes that start with 6XXXX. 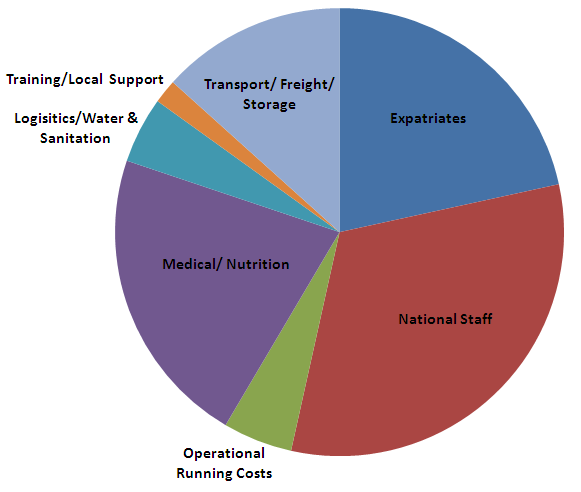 These are the actual expenses for the national staff salaries as they will occur in your bookkeeping. All other entries have account code 1XXXX or 2XXXX. These entries are used to reserve the pending money and to make a difference between the net salary and the taxes. 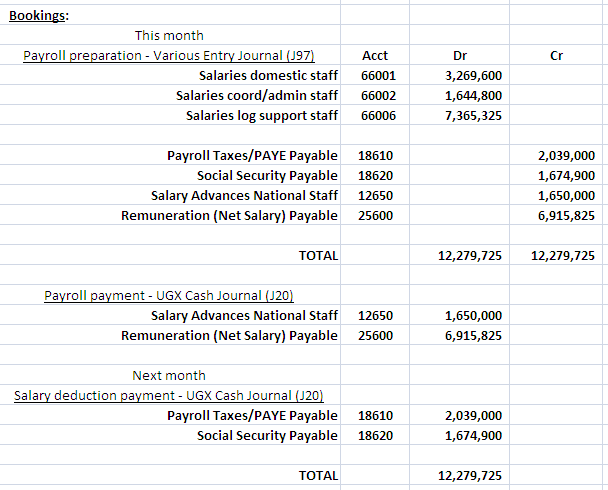 Here you see the total amount of the monthly payroll of the national staff. These are also the first lines of the Excel sheet. Next to the net salary, it also includes the income taxes that we are obligated to pay to the authorities. The 12,279,725 UGX is the total amount of money that the salaries of the national staff will cost us. First we will add these amounts with the corresponding account codes in BooX using the Various Entry Journal. You made the first three entries in the Various Entry Journal. You can only close these journals if the end balance is zero. So we now need to make incoming money entries to balance the previous entries. The costs for the national staff and the autorities are already booked in BooX as costs, but the money is not spent yet. In the next step you will enter the withholdings, the net salary and the salary advances as incoming money in the Various Entry Journal. This way you reserve money yet to pay and you can indicate what part of the gross salary was paid to the national staff as net salary and what part is paid to the authorities as taxes. So the next step is to make the entries in the Various Entry Journal in BooX to balance out the previous entries and make the end balance zero. The total amount of the gross salary is UGX 12,279,725 and this is also the total amount of our previous entries. The next entries that split up the gross salary into the net salary and the withholdings should match this amount. You have completed the entries for the preparation. The next step is the payment of the salaries to the national staff. After you made the preparations in BooX you still need to actually give the money to the national staff. In most projects the staff is paid in cash. If it is a cash payment you will enter this payment in your cash journal, just like you would have done with any other cash payment. Since the real costs are already booked in the Various Entry Journal by using a 6XXXX account code, you don&apos;t need to use this account code in your cash journal to describe the costs. You will use the same 1XXXX/2XXXX account codes to debit the incoming money that you reserved for the actual payment in BooX. You will enter the net salary and the advance salary in BooX from the next page onwards. There a few things you should know if you want to enter the salary advance and the net salary. All salary is paid in cash and in Ugandan Shillings. The national staff received an advance on their salary on the 15th of this month. The net salary is paid at the end of the month, which is the 28th of February. The advance is UGX 1,650,000 and the net salary is UGX 6,915,825 like you can see in the Excel sheet. Ready to hand out the payments? For the preparation you need the HR information from Homere which you will edit in Excel. After that you add the gross salary into the Various Entry Journal in BooX. You enter the net salary payments and the taxes as incoming money to balance this journal. This way you also reserve this money for the payments later on. The actual payments are made to the national staff and also to the national authorities. You need to remember to make the payments of the withholdings to the authorities. This payment should be entered in BooX as a regular cash payment as well. The actual payments are booked in a regular journal, but not as regular costs. The gross salary is entered in the Various Entry Journal with the 6XXXX account code to indicate the nature of the costs. Next to that we enter the taxes and the salary as incoming money in the Various Entry Journal. Now this incoming money should be offset by the entries in the cash journal. So when you enter the actual payments you also use the same 1XXXX/2XXXX account codes. To make this chapter complete you will also make the entries for the payments of the taxes to the authorities. So now you have made the complete payment of the national staff salary for February. Just to be clear we will summarize the steps to take below. Now you are able to perform booking of monthly payroll in BooX using the bookeeping sheet from Excel payroll sheet. You need the information from Homere and you will use two different journals in BooX. In the previous modules you have learned the basic BooX functionalities. This module will focus on explaining the concept of subaccounts and how to book subaccounts in BooX. The subaccounts are special accounts to deal with expat expenditures. You have been selected by MSF as a volunteer. This means that during your mission, you will not be paid a regular salary. You will receive a stipend or allowance for your expenses. This should cover the costs that you will have for your departure and stay in the project country, the running costs at home and for some expenses upon return. To cover your living costs during the mission, you and your expat colleagues will receive a per diem payment. You will receive a daily per diem for every day that you spent working in the mission, but not during holidays. When you go for work to another country (for example for trainings in Amsterdam) you will also receive a per diem. Only expat staff is entitled to a regular per diem. National staff will receive per diem payments if they travel for work to another city or country. The level of the per diem will depend on living expenses in your mission country. It can also differ between the capital and the projects. The HR department in Amsterdam determines the per diem amount and will communicate this to the mission once a year. The HR department in HQ will be happy to tell you more about this. During the FCC in Amsterdam you are also able to ask more about per diem payments. 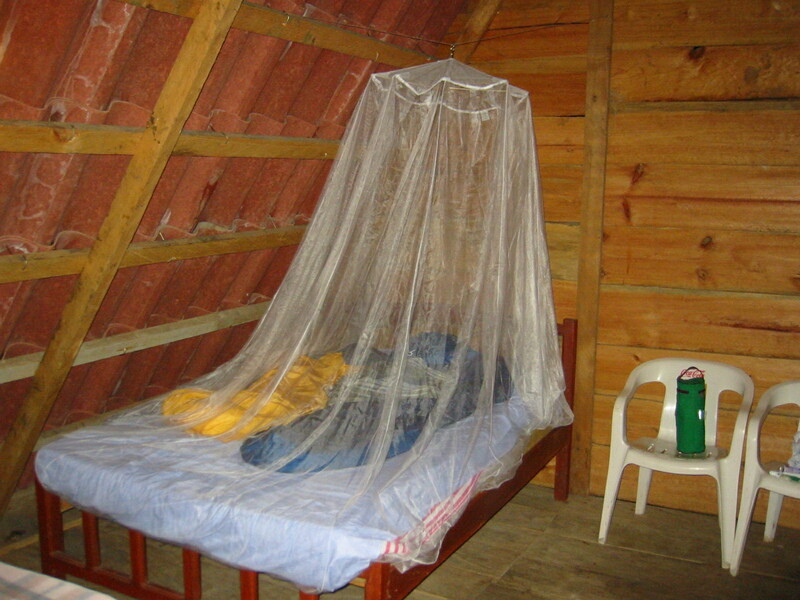 During your mission, MSF provides for your accommodation. You will live in a house or a compound together with your colleagues. You will also share meals and in most missions the food is bought collectively. Since you receive a per diem for your living expenses you will be asked for a contribution to cover the common food expenses. This is what we call &apos;the food pot contribution&apos;. We will tell you more about this later on. 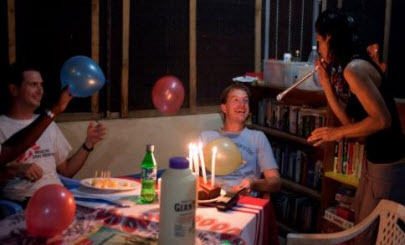 Even though you might end up in very remote places during your mission, there still are possibilities during your mission to go to a restaurant, having a drink at the bar, go to the cinema... You are encouraged to enjoy your free time as much as possible. MSF does not pay for these activities, but you can spend your per diem on this. 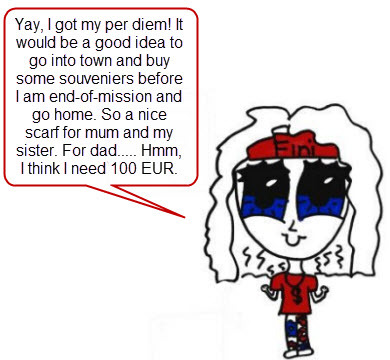 When you go on holidays during your mission you are not entitled to a per diem payment. 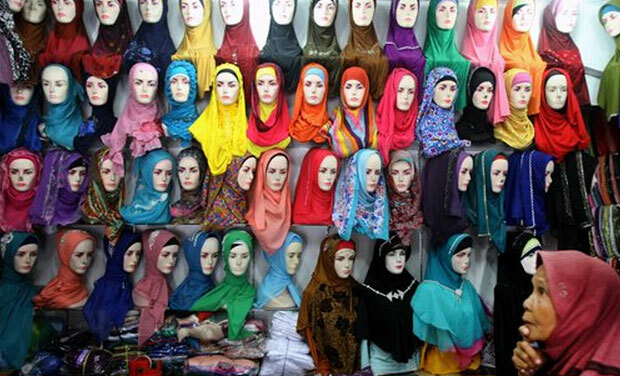 Of course the expenses for this holiday you will have to cover yourself. Probably you would like to call your friends and family while you are away. MSF does not cover personal phone calls. Luckily with internet being widely available you can always use Skype! When we are talking about personal expenses, we already mentioned the food pot. As was explained, the food is bought by all expats together. Every expat and visitor who is participating in the common meals will be asked to contribute to the food pot, this includes visitors from HQ for example. So as a FinCo it is important to keep track of the people who are joining for meals and the total food costs, so you can spread the cost equally. 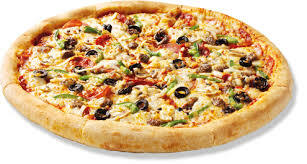 As a FinCo you will use the account code "66260 Food Pot for Expats" to book the food pot expenses during the month. At the end of each month, you will clear the 66260 account by spreading the costs over the expats. On the right you see an example of a sheet to keep track of the monthly food costs. To enlarge the image, click in the upper right corner. As you have seen in the previous modules, handling a lot of money can be risky in the contexts in which we work. We do not want our staff to be exposed to unnecessary risks during their mission. Therefore we have created a service for our expats, to facilitate handling your personal expenses during your mission. A subaccount is a kind of bank account for each individual expat. Like any bank account you are able to deposit money and withdraw money from it. This money you can use for your personal expenses. It is important that you never overdraw your bank account. In other words you cannot have a negative balance on your MSF bank account. As a FinCo you need to make sure that other expats do not overdraw their subaccounts. You will prepare a monthly report showing the balance for each expat and if needed you will remind your colleagues to deposit money. Your regular bank will charge you for having a bank account. MSF OCA offers this service for free! The subaccounts are managed in BooX using the account code "15640 Expatriates Payable (Subaccounts). A subaccount is simply created by combining the account 15640 with a four digit number. The four digits usually represent the employee number. Fini&apos;s emplyee number is 1111, so her subaccount is 15640-1111. It might sound a bit complicated. Let&apos;s take a look at an example. This is how a subaccount of employee 7079 in the BooX Reporting module would look like. By choosing this number, it will give you an overview of all movements booked onto this subaccount. See also the next page for the detailed overview of expenses. As with any bank account, money can be added to the account (deposit) or taken out of it (withdrawal). Here are some examples of when money will be added or taken from the subaccount. When an expat leaves the mission, you will settle his or her subaccount. This means that you will estimate the remaining expenses, deduct these expenses from the balance and pay the remaining money to the expat. 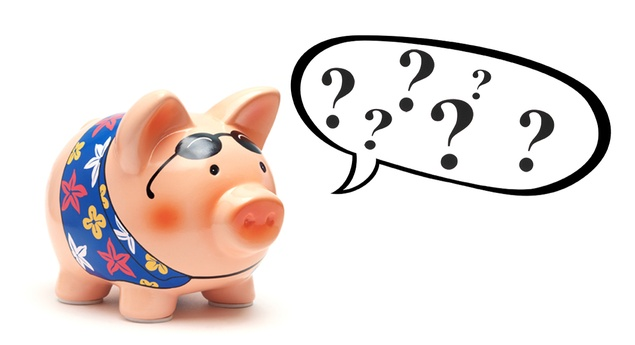 If the subaccount has a debit balance, then you will ask the expat to deposit money before departure. In some cases you might not be able to correctly settle the subaccount. There is still a balance remaining on the subaccount after the expat has left the mission. In that case a 20660 form needs to be prepared. There is a whole procedure on 206XX entries, explaining the process. In short, you will book the remaining balance to the account 20660 and with the corresponding form, you assure that the remaining amount is transferred to the expat by HQ. You will now make a per diem booking to a subaccount. For this exercise you would like to pay a per diem to Fini. In February she receives a per diem of €450. In BooX you will also use a various entry journal for the per diem payments. That is the same sort of journal as you would use when entering the salary prepation in BooX. As you already know, the most important feature of a Various entry journal is that the balance always should be zero. Therefore you will make two entries in this journal, for bookkeeping reasons. The first entry will be for the expense to MSF, then another entry to credit Fini&apos;s subaccount. From the next page onwards you will book the per diem in BooX in a various entry journal. You will do this monthly for every expat. You already dealt with petty cash payments before. So the next exercise should not be too difficult. Fini is asking for a payment from her subaccount for personal expenses. You can give her some money from the petty cash box. You give out the money according standard procedures, and you will make a BooX entry in the petty cash journal. Yes, you, since your assistant has a day off, again! When you book the per diem on the subaccount there is not yet an actual cash flow. The per diem is only put in the subaccount of an employee, the actual cash flow is when the employee receives money from the petty cash box. So just like with a cheque payment or the tax payment you already reserve the money, but the actual cash flow only happens later on that month. To keep track of the actual costs and the cash flow, you use the various entry journal and the "15640 Expatriates Payable (Subaccounts)" account code. The "66220 Per Diem" account code is a description of the actual expenses. The entries on the 15640 account balance each other out and is used only to indicate the cash flow. This was the last actual chapter of the course. In this chapter, we learned how to deal with subaccounts, the accounts that are used to keep track of the expenditures and per diem of each expat in the mission. After this we have a short chapter to conclude this eLearning course. Then you are ready to start the FCC in Amsterdam. In this chapter you have learned about per diem entitlements, subaccounts, personal expenses and MSF expenses. On the next few pages, we have a quiz for you. Please consider if the listed expense is a personal expense or a MSF expense. Then, select your answer and click the Check your answer! button to see if you were correct. This chapter is going to familiarize you with the current tool(s) that exist in MSF for making a budget (Part 1) and controlling an already approved budget (Part 2) during a certain period of time. To do this, MSF has created the MSF BT (Budget Tool) which combines the above mentioned functionalities in one tool. The same as BooX, it is based on MS Excel. Be able to navigate in MSF BT and understand the different functionalities for creating and revising a budget. Know how to do entries in MSF BT and to send a budget to different stakeholders. 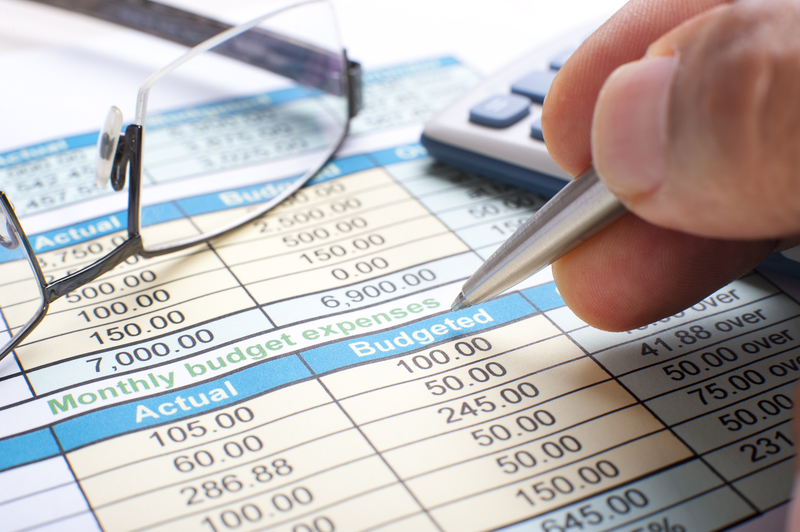 Know how to create a budget control report. 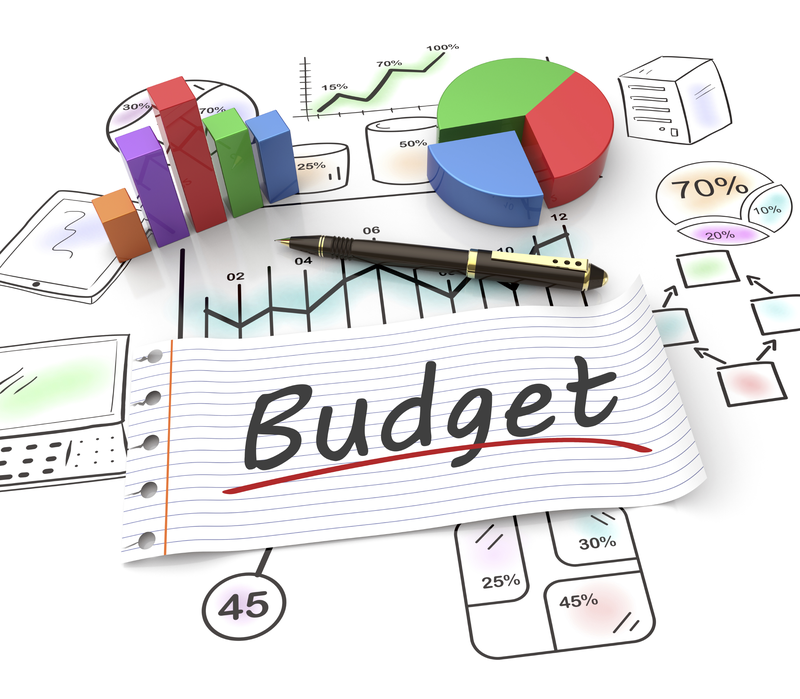 Now that you have learned how to create or revise a budget, we would like to also show you how to control your budgets. In BT you therefore have the BCR functionality which provides you with a report and a viewer of all your expenses per project. The example will still be based on the Russian mission and we are in the month of August. So, let’s start! You have successfully completed the BT and BCR module. You have now almost completed this course. In a few weeks you will be on your way to your first mission. In this final chapter, we conclude the eLearning part of the course. We have some last things we would like you to keep in mind. These are not MSF standards, but just personal experiences. We can imagine at this moment a 6, 9, or 12 month mission feels like a long time. And to be honest it is a long time to be working in such a high intensity environment, away from family and friends. Yet, in the lifespan of a project it is not so long. While expats come and go, national staff stays. This gives projects a weird dynamic. Imagine working for an organization where every half year you have a new boss. You will notice that during your time in your project you will have some ideas on how things should be organized, the structure of your team and who should be promoted and who should not. This is good, you have to, but please think carefully before you change everything. Very qualified staff before you have come and decided on the current structure, and when you change something, it has to last when you are not there. 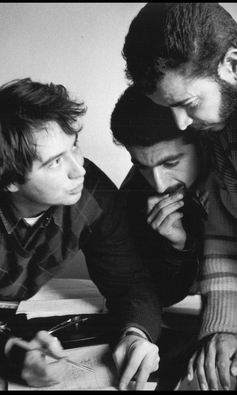 Some national staff refer to expats as "change agents": they always come and change whatever is there. Living with 7 or 8 people from all over the world, with their own habits and peculiarities in a small compound and having to work with them as well, was probably most difficult and most enjoyable. Especially in high security situations where movements are restricted you get to know each other very well. Usually there is a TV with some DVD&apos;s and you can read books, but for a social life, you have to rely on each other. You will see that small gestures are well appreciated. Building a table tennis table, getting stuff for a Badminton field when you are in the Capital, baking bread, making pizza, growing fresh herbs or fruit, you name it. You could have some amazing times and build friendships that will last forever. "Good morning", "problem", "big problem", "small problem", "no problem", "one coffee please", "thank you", "that is too expensive". Oh yeah, and the local word for white man or woman is always good to know. I have also found out that it usually easy and well appreciated to ask questions about the local customs. I always valued learning these small things. You are about to go to places in the world where not many people can go. The countryside is often breathtaking, the people fantastically different and cool-looking, and the work we do is extremely relevant. It is hard work, dirty, insecure and difficult, but amazing. That was it. You have finished the chapter and the eLearning course. You are now ready to start the FCC course in Amsterdam.